One photo for now, you supply the thousand words. Currently I'm in Lordsburg, New Mexico - the final town stop, only 80 miles from the Mexican border. I just picked up my final mail drop, number 28 of 28. Flashbacks hit, I remember 4 months ago, sitting in my parents living room, holding this box, this one in particular, the final one; hoping with all my might, mental and physical strength, that I might see it again, here, now, like an old friend. But more than simply seeing it again, I hoped all those months ago, that when I held it again, I would somehow be different. Same hands grip the box but maybe just a little more weathered and tanned. Not as visible, the growth of a person grateful for the innumerable acts of kindness shown by strangers, someone who walked up mountains to feel the confidence of the wind at the ridge, who heard calmness in the desert silence at 2am with eyes drawn to constellations above, tasted love as the pouring rain soaked through their hood and onto their face, and understood freedom by the scent of the Ponderosa Pines- the smell, independent of time, that reminded them of the forest on their first hiking trip to the Grand Canyon as a child. All of these hopes I place in box 28 along with my dehydrated food and protein bars. And as if blowing out the candles on a birthday cake, I muttered these wishes to myself, placed 28 inline with the others, drove out to the Canadian border, said goodbye to my family and started to walk south. I'll use these final 80 miles wisely to eat the rest of the dehydrated dinners, protein bars and congratulatory goodies from my parents and sister who have dealt with my highs and lows (litteraly calling them from valleys and mountian tops). And to hope the trail has bestowed some wisdom on me. Give yourself to the trail and it will give you a hundredfold in return. The water sources have all been interesting to say the least down here in New Mexico. The comments for this one said to look for the Goldfish...which I took to mean that someone left yummy cheesy fish shaped crackers behind. Boy how I wish I was right on that one. Among the dozens of goldfish in the trough was also this bigger guy swimming around. Anyone who identifies the species gets a million bonus points. For a moment there, it stated to look like I was back on Kansas. The weather has been absolutely wonderful in southern New Mexico. The nights not too cold but cool enough to feel cozy in my sleeping bag and days that are hot but not 'everything should be melting' hot. And to top it off there has been almost no rain to speak of. 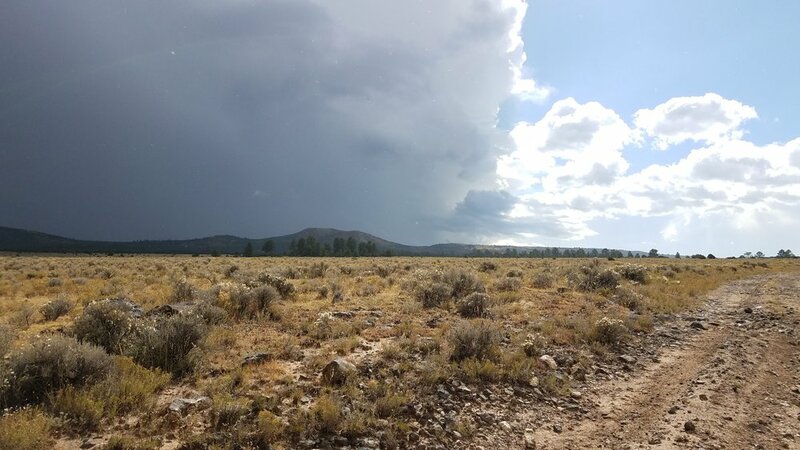 Incredibly the only rain in the last few weeks came when we were under a porch roof at Burro Mountain Homestead! One of the first crossings of the Gila River. 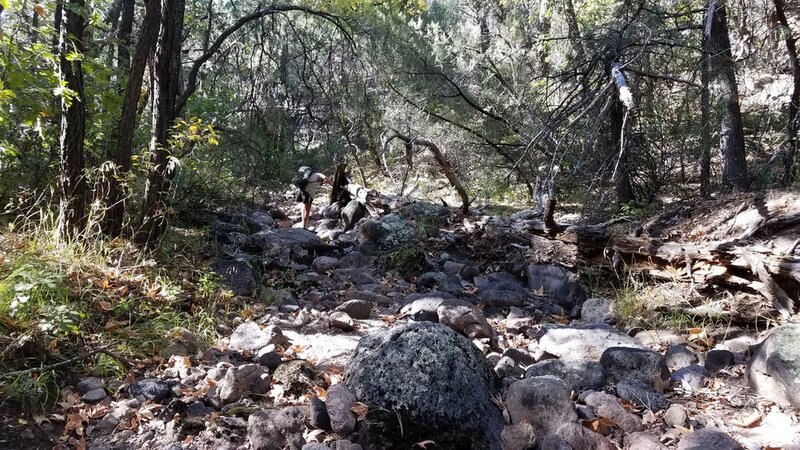 We would go on to cross the Gila about 50+ more times. Wet feet for dayzzzzzz. The sun has been pretty intense down here so I'm still keeping covered up as best as I can. I recently started doubling up my shirts because of all the holes that have developed in the merino wool. Fortunately the holes in both shirts are in different places so paired together I get one complete shirt! 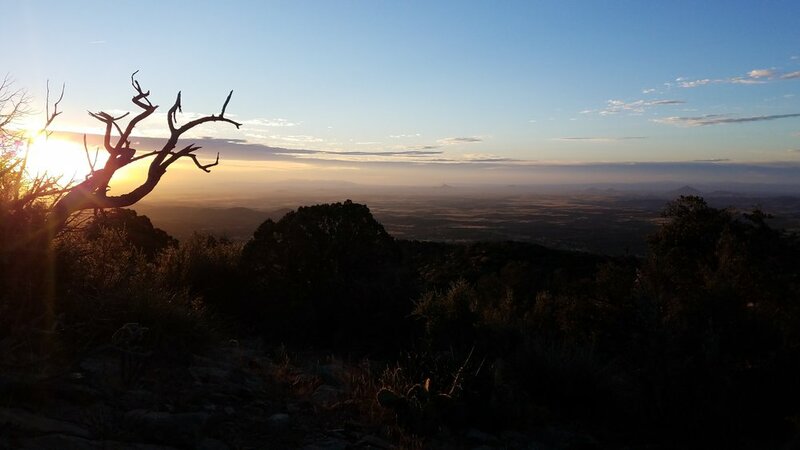 The topo of the Gila Wilderness is incredible! And with the river running through it's a green paradise in the New Mexican desert. Approaching the Gila Cliff Dwellings. An incredible view from the dwellings. It's amazing many parts are still standing since being built in the late 1200. I wonder in NCARB will let me count this as continuing education credits? 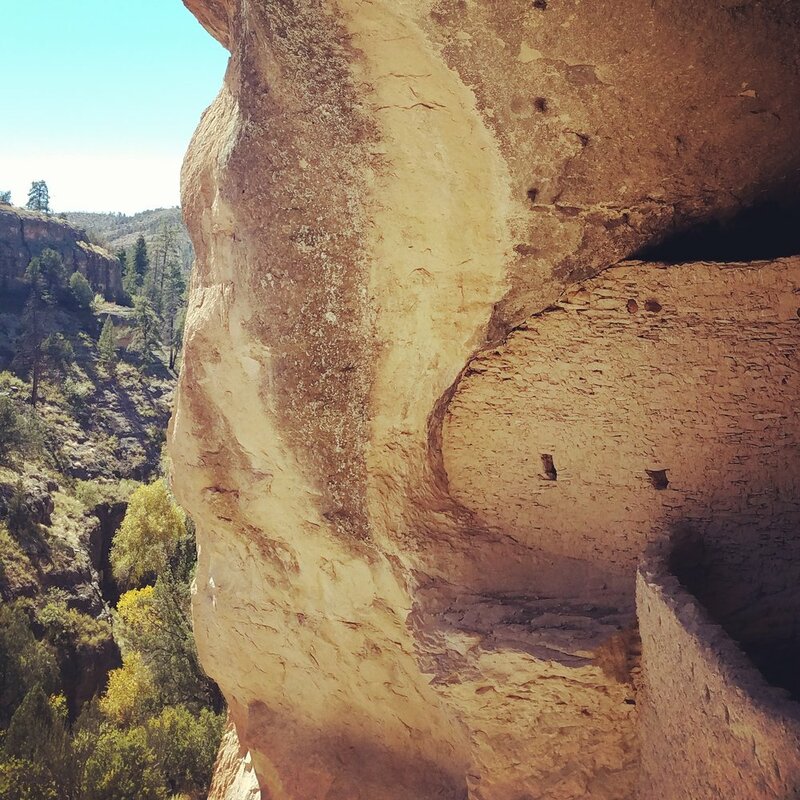 Gila Cliff Dwellings, 46 rooms total in 5 caves housed about 60 people. 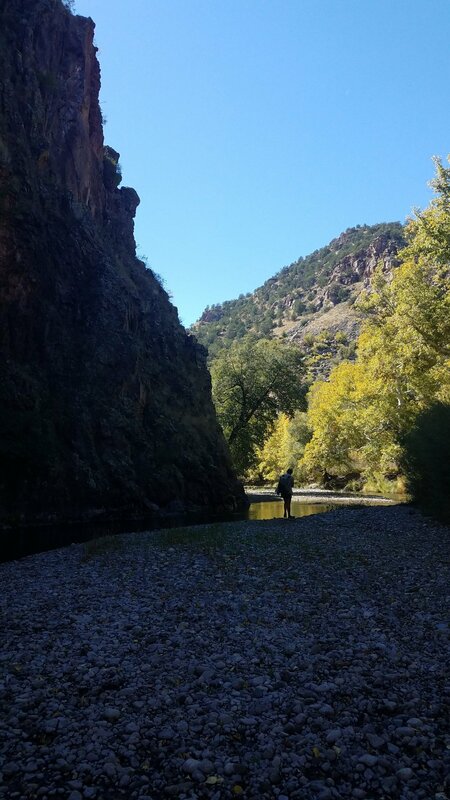 The Gila had some dramatic cliffs making for so many river crossings. At times we'd walk only for a quarter mile only to come to a cliff, cross the river, hit another cliff after a quarter mile and have to cross back. This went on for miles and miles making progress excruciatingly slow. Luckily the river wasn't moving too quickly but the water level was at times, nearly waist deep. From the amount of debris around the river it's likely that it floods often which means the trail was hard to find and left us mostly bushwacking through dense vegetation. One of the most beautiful rocks I have ever seen. This is Doug the hermit. His description, not mine. One of the coolest folks I've met. He moved out to the woods 18 years ago and hasn't looked back. He goes into town once a year to get all his food and spends the rest out in his one room cabin. An absolutely delightful person to spend a few hours with! Doug's garden. Currently he's growing a few different types of tomatoes, cucumbers, and bell peppers. A beefsteak tomato from Doug's garden. It was delicious! 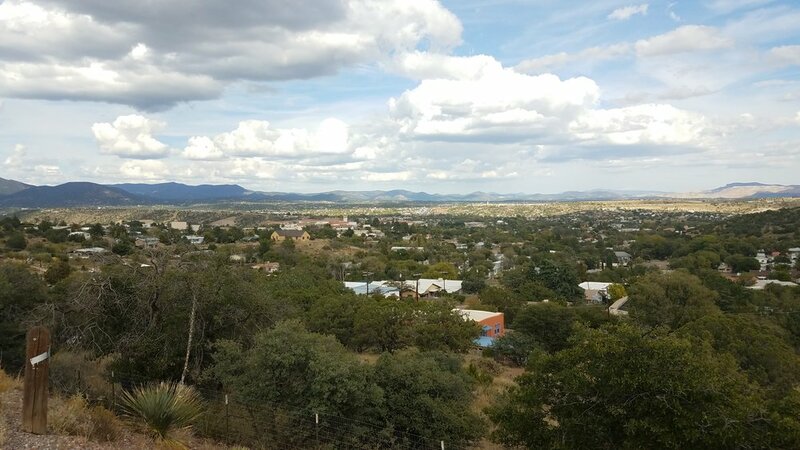 Silver City, one of my favorite towns in New Mexico. 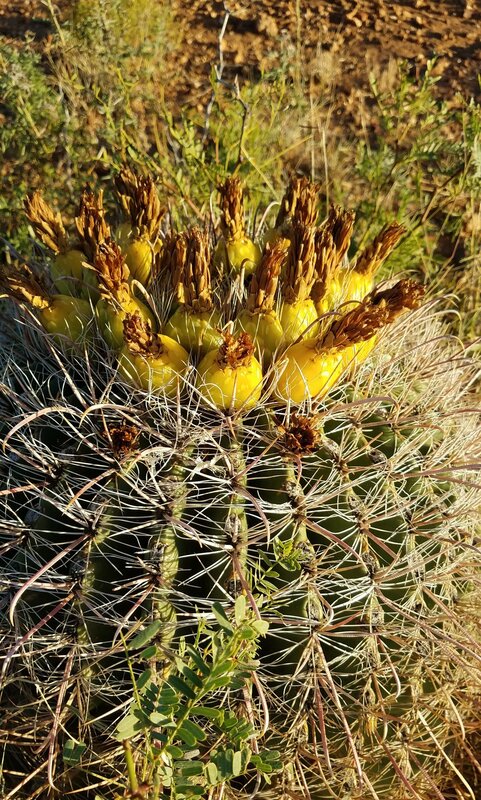 There is no shortage of pokey things out here. I definitely won't miss accedently kicking them and having to pick needles from my toes. I believe this is an Agave plant, please correct me if I'm wrong. Looking back at the Big Burro Mountains. Watching the sunrise as we walked into Lordsburg. Here's a photo (and caption) recap of the past two weeks! Hopewell Lake. 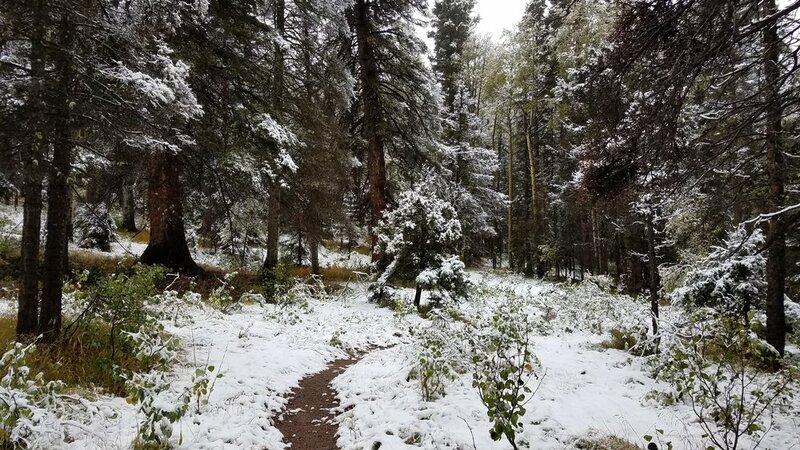 After leaving Colorado I'd thought we were in the clear for warm enough temps to keep the snow away but yet again, the trail always has plans of its own. Will and I really lucked out finding this shelter particularly this night. We pulled in after a full day of rain and sometime in the night temps must have dropped because we woke up to about 3 inches of snow the next morning. Just before this photo was taken I'd met Cookie and Mike in their beautiful Airstream Trailer. They invited me in and shared a wonderful breakfast and equally fantasic company! After the snow melted the trail was a complete mud pit. As the mud stuck to my shoes they just grew heavier and heavier. I couldn't imagine hiking with that amount of weight on each foot day in and day out. Days like this I'm so greatful I hike in trail runners. The start of all the yummy New Mexican water sources. This one was labeled as a "tank" on the reports with the comment "don't think of this as a pool of disgusting water. Think of it as an opportunity to discover how badly you want to drink." About 3 miles to Ghost Ranch the views and environment drastically started to change and it finally started to feel like I was in New Mexico. Canyons, cliffs and sand here I come. Tons of movies have been shot on the Ghost Ranch property. Here's the cabin from City Slickers! 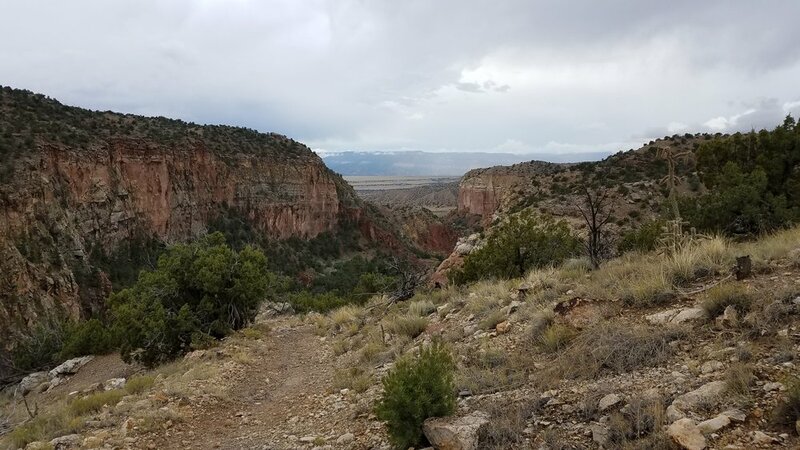 Looking out over the cliffs from the Ghost Ranch property, watching the storms pass. Just look at that detail. I mean no car passing at 60 mph can appreciate that level of detail. Ah, life at 3 mph is pretty grand. 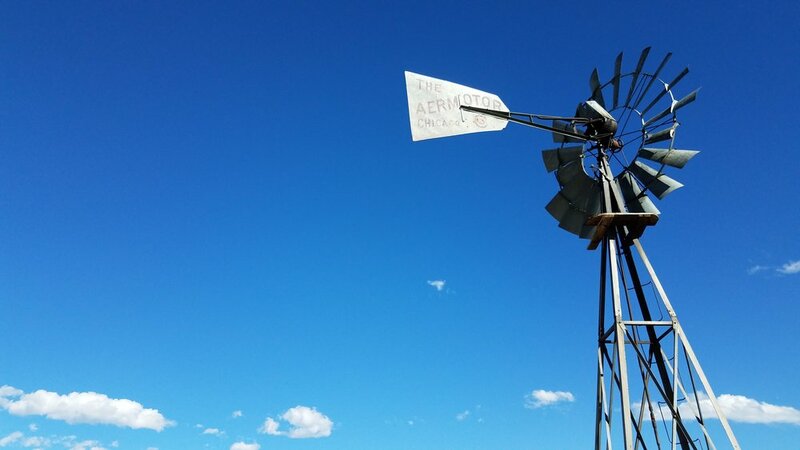 Luckily the wind was howling the day we left Cuba so the windmill was pumping out water. Water sources are becoming farther and fewer between. Nothing like a 50 mile desert view. 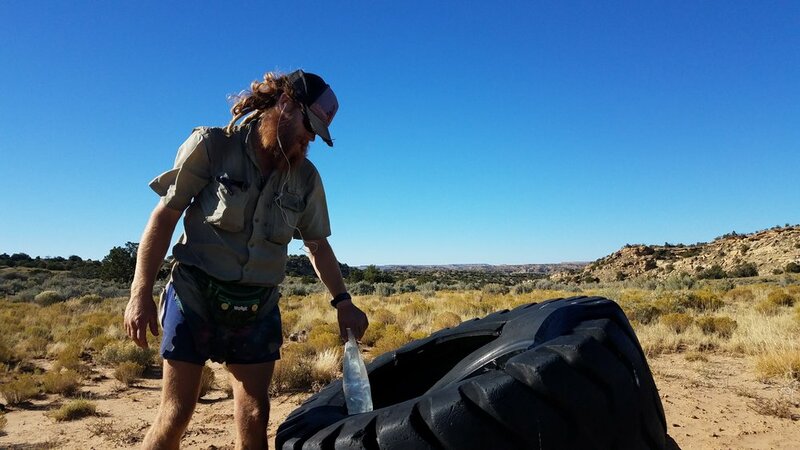 The water report gave instructed to find the pump and well by locating the old tire... It wasn't wronge. 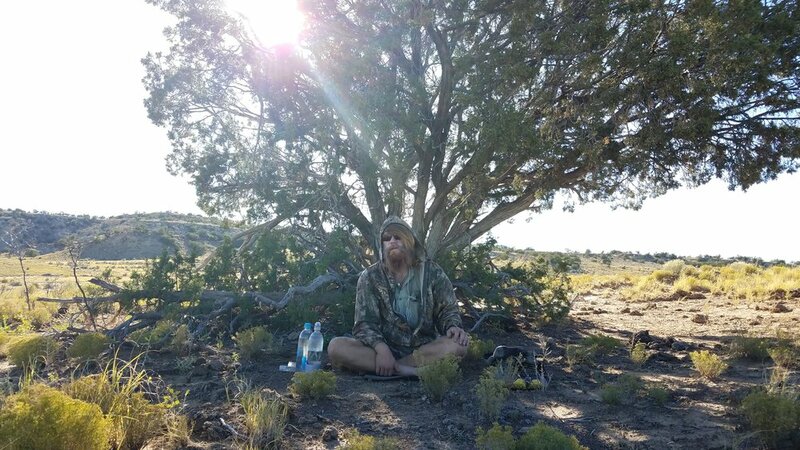 Merman himself looking like a yogi in the shade of this juniper. Cars seemed to pass us rather cautiously as we walked past a correctional facility on our way into Grants, NM. Was glad I didn't have an orange color scheme to my hiking outfit this year. The lava fields of The Malpais national monument. 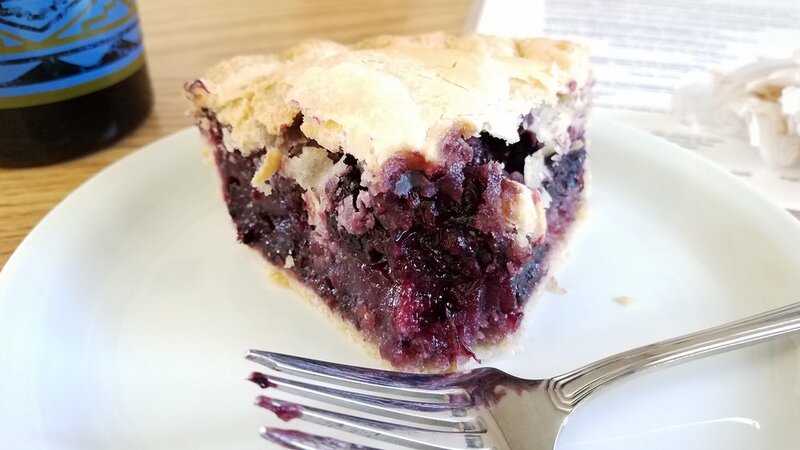 Can't wait to get to Pie Town and finally get my birthday pie, albeit a month overdue. 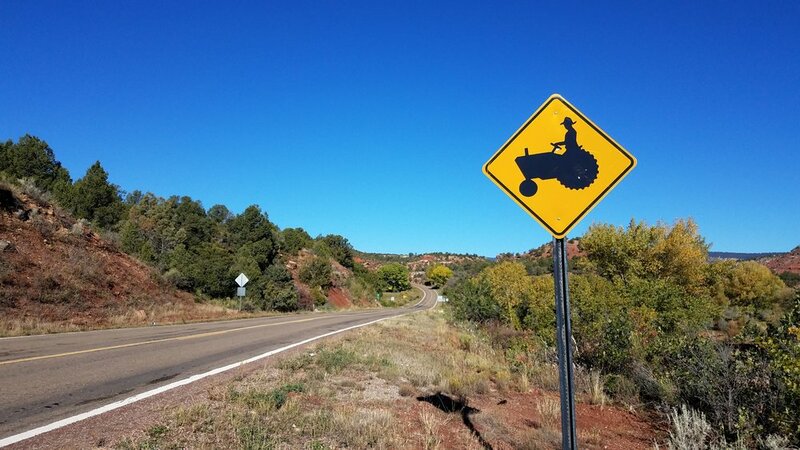 Getting to the Thomas' Ranch. They are a couple of wonderful folks that open their home (and more importantly water tap) up to CDTers. New life goal: sponsor an adopt-a-highway section with a title as great as this one. 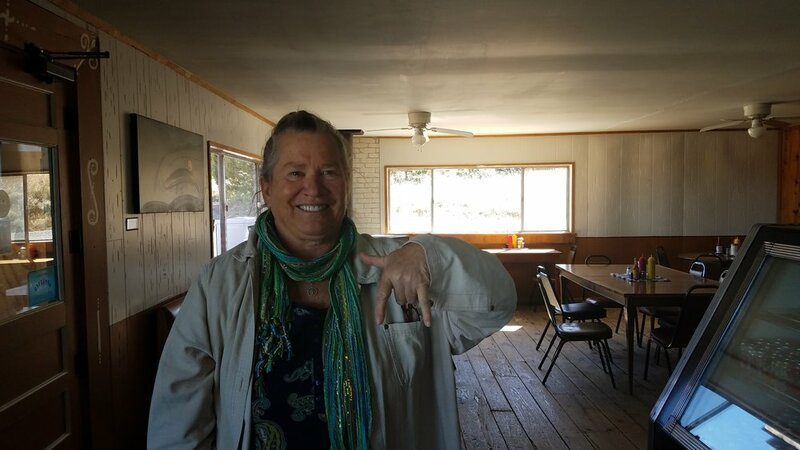 The legend herself, Nita, who owns the amazing hiker hostel, The Toaster House. Here's quick recap of the past few weeks. I've been more or less trying to hurriedly get through Colorado because of the impending weather situation. Spoiler alert, didn't make it out of the state before the snow but it wasn't enough to shut us down. 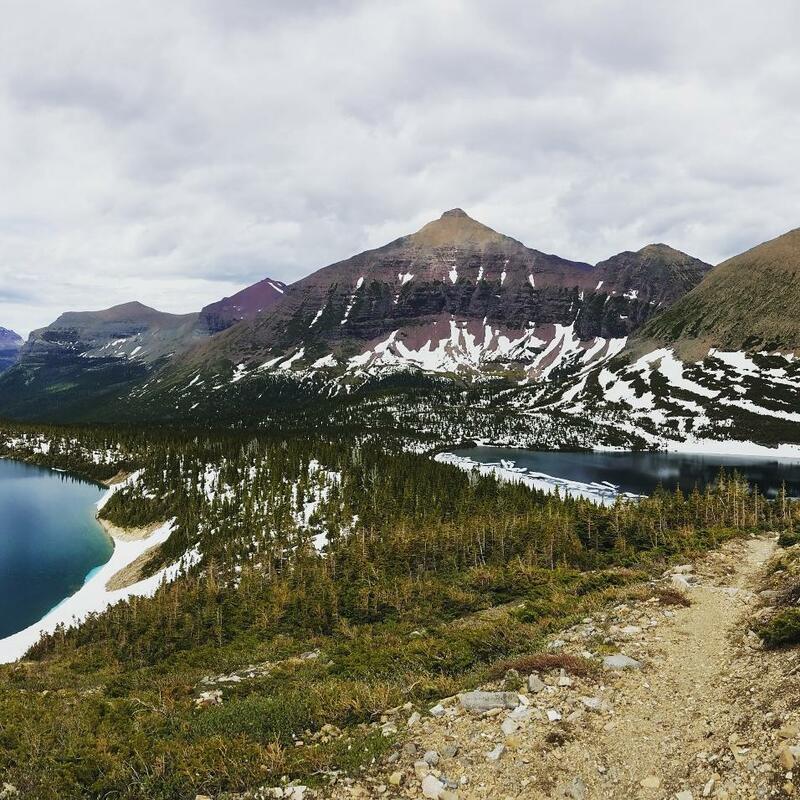 The San Juans were incredible and totally worth doing (There is shorter alternate if you don't/ can't get through them). The first four days in the range we had beautiful, although very windy, weather. 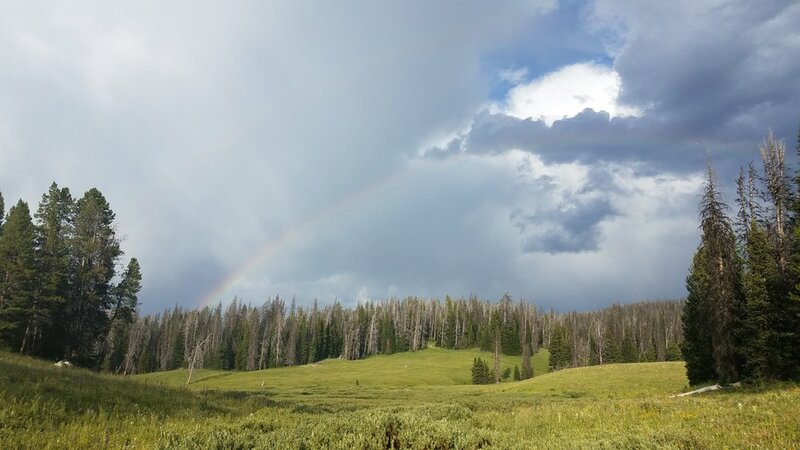 Then, a day out from Pagosa Springs, things changed rapidly. All 20-some miles into town, a constant mix of snow, sleet, hail and rain steadily fell. Needless to say Pagosa Springs quickly became one of my favorite trail towns. One because it's picturesque little town but also because there are buildings there complete with roofs and heat. Leaving Pagosa Springs it was clear the storms brought a good amount of snow. We ended up changing our routing around a little but still managed keep the hike alive without having to hitch around any parts. Yay! And then on to the New Mexico border! Hopefully sunshine and warm weather await us! Enjoying perks of the Colorado Trail and CDT alignment. I can get used to this! Overall since the two trails met up, the trail maintenance and overall quality has improved. Anyone interested in a 480+ mile hike should seriously consider it! The top of Mt. Elbert with Will, El Madador and Merman. 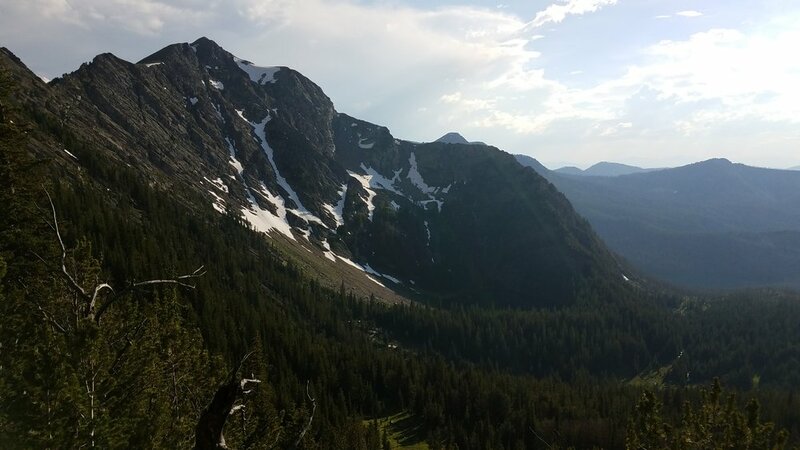 The Collegiate Range, west route. We hit the color change of the Aspen's just right! 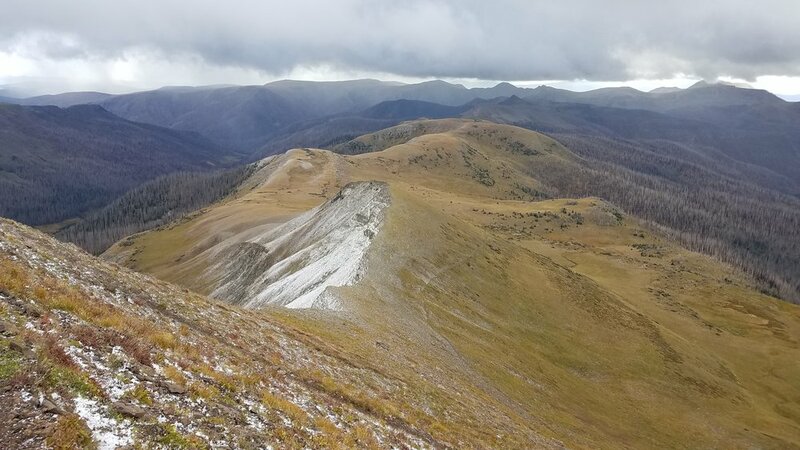 The start of the San Juan Range. Snow Mesa, where, you guessed it, it snowed. 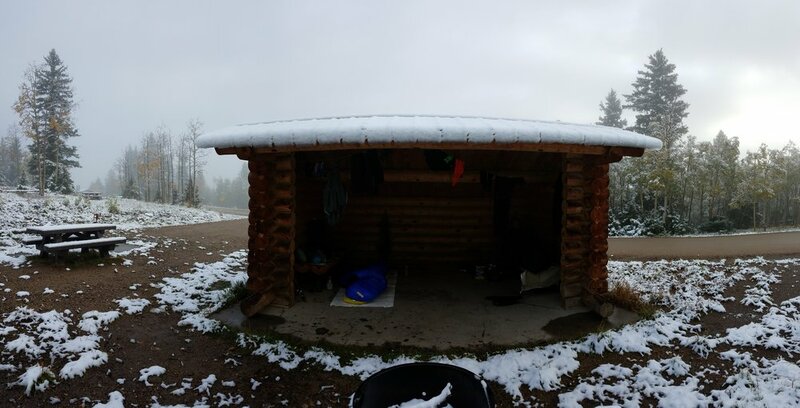 An emergency shelter we found and stayed the night in. Someone even left coffee and French Press in there for us. Quick story: Not this night but the night before we had incredibly strong winds come through in the evening. So storm in fact that my tent blew over, tent stakes ripped from the ground. I tried setting it up again but to no avail. It was by far the most intense wind I'd ever camped in. 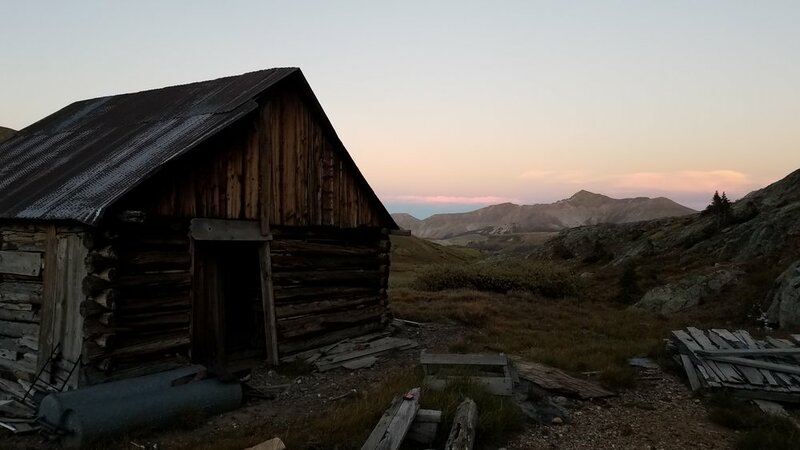 Luckily, there was an old mining cabin I was able to squeeze in with Will and it was shelter enough to get some sleep. The window and the pyramid out in the distance. We took a side trip over a few scree fields to get to the window- totally worth it! And then the storms came. The day heading into Pagosa Springs, CO. The hail was so intense coming sideways at me I had to shield my face with my hand for most of the ridge. 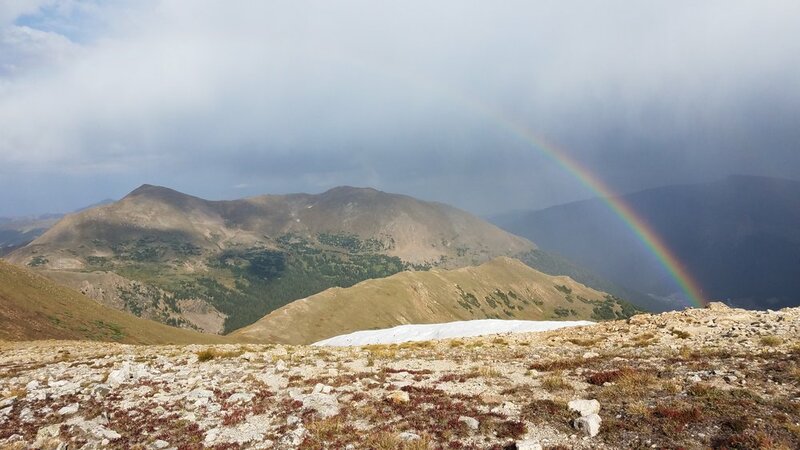 It's not ideal to be above tree line in these types of storms especially when you don't know if lighting will erupt at any moment but the quickest way down was to keep moving forward. Sporting the ever fashionable umbrella. The aftermath of the storms after our stop in Pagosa Springs. Our reroute took us through Platoro, Colorado where Will contemplated taking another method of transportation. Right there, that fence, the one that looks like every other fence... that's the CO/NM border. Nothing fancy, bright or flashy, just like the CDT. You wouldn't know it unless you were looking for it. But we knew it, and we celebrated. 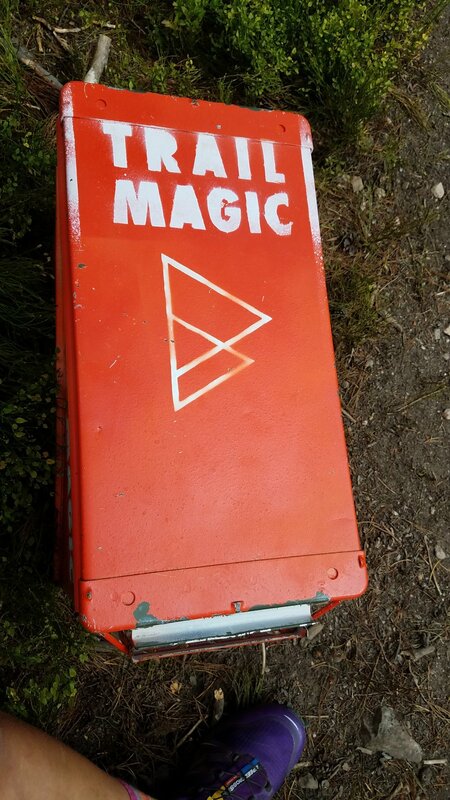 The marker to prove It! Sunrise this morning and today will be another great day. I'm getting off trail for a few days again this time to visit with some family in the area and attend the wedding of friends Kelly and Sam! The timing for this one worked out so well, it's not often that I'm hiking through the same state that my friends are getting married!! 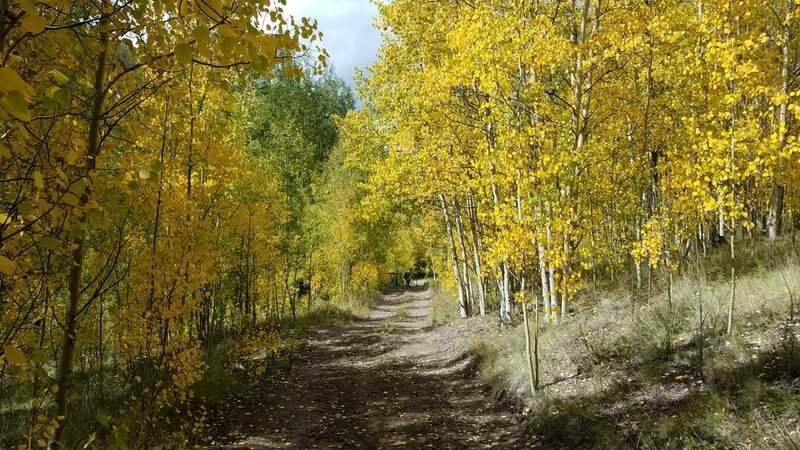 I hopped off trail this time near Grey's Peak trailhead and will be back in 3 days time. Again I forgot to take any photos of the wedding as I was so excited to be at the ceremony, catchup with old friends from college and meet new friends. I was in awe of the love surrounding everyone at the wedding and was greatful to witness it. Once again I was smiles from ear to ear all night long. Can't wait to visit Fort Collins again! It was also so comforting to see family in Denver and hang out with my cousins! Can't wait to see you again, hopefully soon! Figuring out which ridge we should follow. 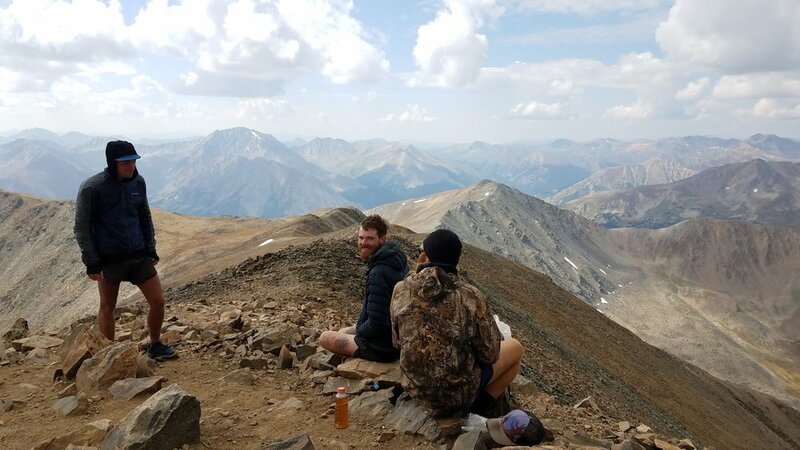 It's getting colder and colder now that we're consistanly above 12,000+ feet. More time up on the ridges. 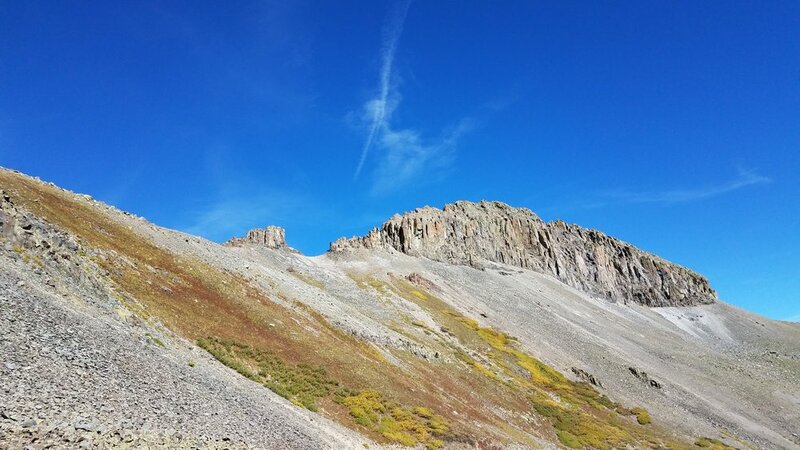 I love walking up this high but it can get concerning when you're above tree line for miles on end and there's no place to hind in case of bad weather. This day in particular Will and I had to hike past dark to finally get down low enough to find some trees and take cover from the howling winds. Finally made it to where the Colorado Trail and CDT meet. And if you didn't know by seeing the signs on the trees, the condition of the trail was enough. For the past couple days up on ridges, there wasn't much trail or signage to speak of. Not that that's a bad thing, by now we're conditioned to it but it was pretty funny that as soon as the trails merged, magically it was like walking on the PCT again. Well kept trail, cleared of trees and switchback. So many switchbacks going up and down the mountains. Nope, nope, nope, staying on the CDT/CT. Over the past couple days the air has been increasingly hazy due to all the forest fires happening right now. There are a couple in Colorado, Montana and the Eagle Creek fire in Oregon. Special thoughts to the CDT NoBo's and PCTers that they all stay safe this hiking season. Entering an area with old land mines. Definitely didn't go off trail in this section. Some kind of old bunkers or something in the hazardous area. Some old timey locomotives in Leadville. Leadville, is one of my favorite towns on trail so far and os the highest incorporated town in America! It's been a crazy 14 days! Lots of CDT miles in there but most importantly I spent some much needed time off trail at Grace and Peter's wedding. I was hoping to post some non-trail photos of the wedding, but realized I barely took any because I was simply enjoying the experiences so much. Being there in the presence of so many loving family and friends, I just couldn't stop smiling. Will and I at the top of Parkview Mountain. One of the first bigger climbs after getting into Colorado. Eclipse Day! We didn't get 100% coverage but I didn't mind with a vantage point like this. Entering the Never Summer Wilderness, supposedly names because there is snow up on the ridges year round. Entering my third National Park of the trip near Grand Lake, CO.
Shadowcliff Hostel in beautiful Grand Lake. This was my departure point for Grace and Peter's wedding. I'd be back here in just five short days after the festivities. Getting back on trail after such an amazing break visiting with friends and family at Grace and Peter's wedding was hard. My mind and body were thankful for the time off and I felt recharged but I can now understand why many hikers who take breaks from trail don't go back. Life off trail is pretty comfortable. Mosquitoes aren't harassing you constantly, getting water is as simple as turning a nob and and you aren't always dividing miles by 3 to determine how long it will take to get some where. But, I began this trail with the intention of walking from Canada to Mexico and by gosh, I'll do everything I can to get there. So back on trail the miles continue but now with a fuller heart. Treated to a beautiful sunset at an actual campground. I'm loving Colorado- let the porcelain challenge begin!!! Yep, pretty sure I'm going to have to climb that. Coming out of the Wind River Range I knew the next section of the CDT would be as stark a contrast as anything I seen on trail this far. 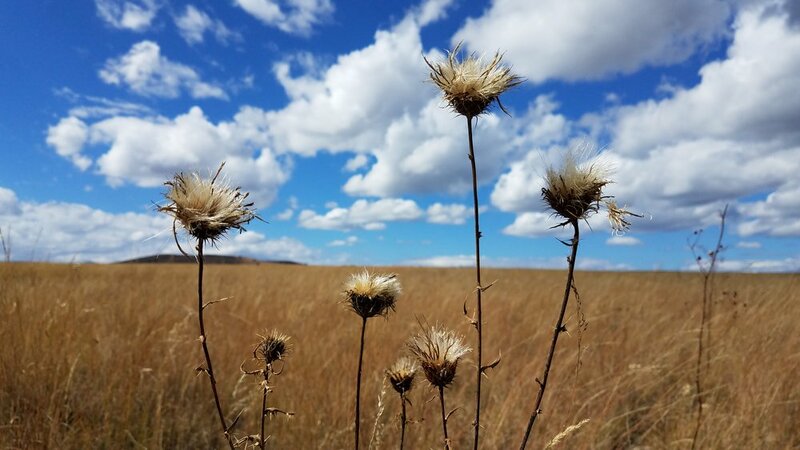 The Wind's with plentiful water, cool temps, vegetation and an abundance of weekend hikers. And, as the NoBo's warned, the desert on the other end of the spectrum with ticks, blazing heat and long road walks and few humans. So heading into South Pass City I knew things were about to change. I was excited though and in good spirits. For one, I had a bit of a injury in the Wind's and it now seemed I was on the recovery side of things. My last view back at South Pass City. It was my quickest resupply turnaround probably be used there was simply nothing there. Mainly a museum historic town, I picked up my package and was on my way with not even a restaurant to pillage. Most of the Red Dessert consisted of road walking on dirt or gravel roads which was much better on the legs than pavement. With little elevation gain and loss, the miles came easier on the body but not on the mind. It was a weird experince to get excited for a slight bend in the road. And I'm sure I dozed off at times only to wake up and realize I was still on trail. Here the CDT coincides with the Oregon Trail for a bit. the sun was brutal at times, scorching any skin that wasn't covered. This shot was taken looking back north at an approaching storm. I did my best to outrun most storms out there because I was the tallest thing for miles around. 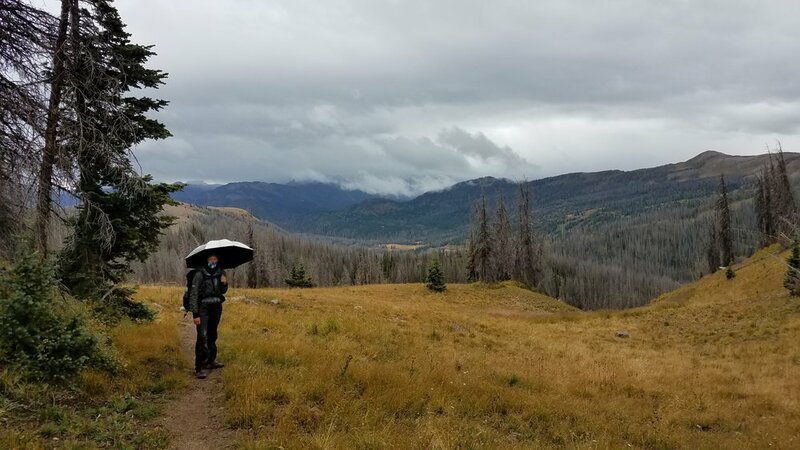 I find that lack of shelter and an approaching storm directly corresponds to the pace at which I hike. Thus there were many desert miles in which I was nearly running. 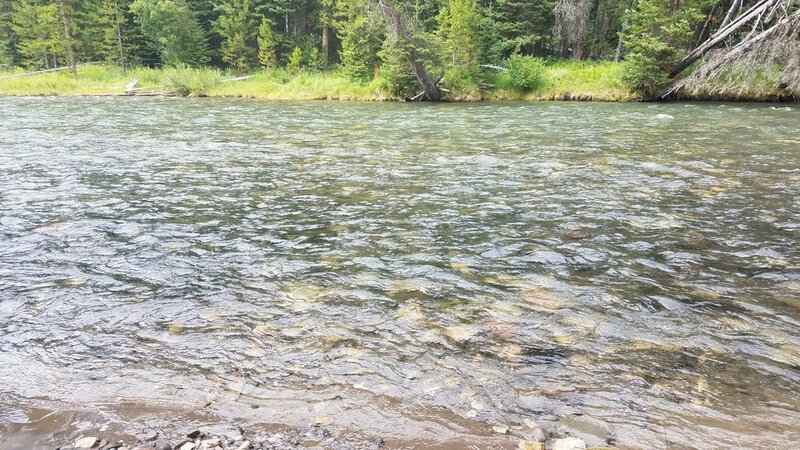 The best water sources out there were natural springs that had been fenced off so pack animals didn't have access at the source. The worst water sources...well when you're thirsty enough water is water. The stretch of trail just to the south of Rawlins had some water sources that were especially alkaline and therefore undrinkable. It when on like this for about 35 miles. Finally starting to gain back some elevation just before hitting Encampment, WY. A day under two months and I hit the WY/ CO border. 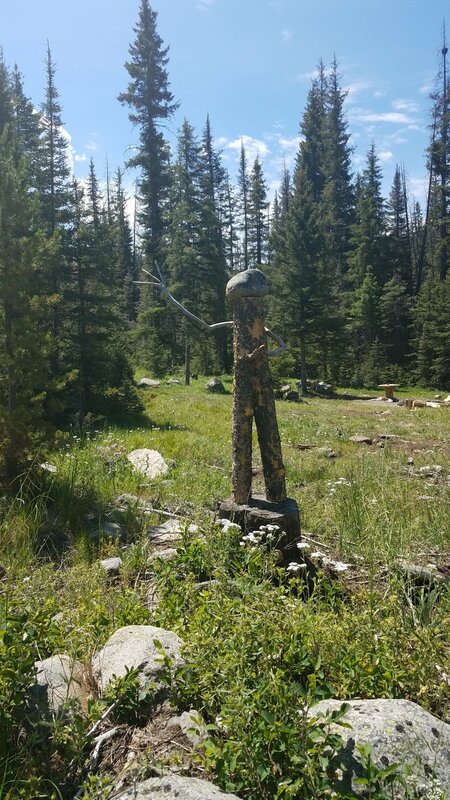 It felt incredible to hit this marker because I knew I would soon be headed back up into the mountains and also because I had been hiking with another SoBo, Will, since Encampment. This was the first time I was hiking with another SoBo CDTer really since the Bob Marshall wilderness in northern Montana. I think on our first day hiking together, Will and I talked nonstop for 12 hours. I hope my face says it all. For now I've got my eye on the prize, which is getting to Grand Lake and catching a flight out of Denver to make it to my dear friends, Grace and Peter's wedding. The past week or so was as rewarding as it was exhausting. 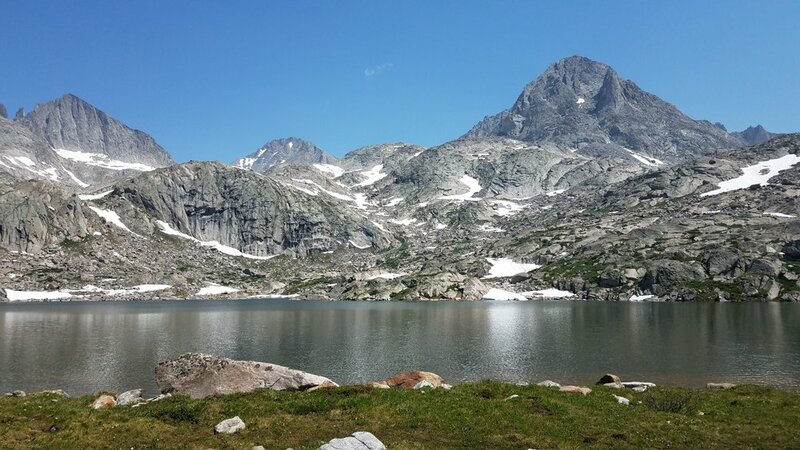 The section between Brooks Lake Lodge (or the nearest city Dubois) and South Pass City is known as one of the most beautiful because the CDT goes through the Wind River Range. It has been fun continuing to see the NoBo's and they all described the Wind's as their favorite part so far so needless to say I was pretty pumped to get there. After a day and a half out from Brooks Lake Lodge and still finding myself in marshy forest, I was starting to think the Wind's were a NoBo conspiracy but by the evening of the second day I started to see snow covered peaks and knew I was close. Two of the big decisions a CDTer is faced with in this section is whether or not to take the Knapsack Col and The Crique of the Towers alternates. 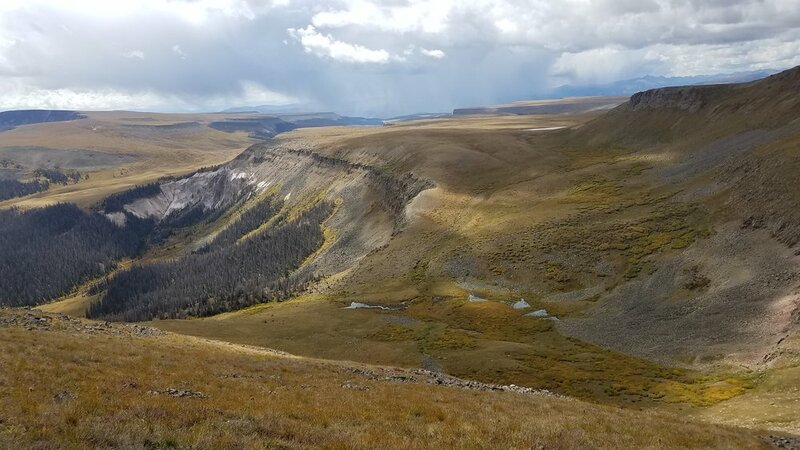 The traditional CDT tends to stay at lower a lower elevation (around 10,000 feet) on the western edge if the Wind's. 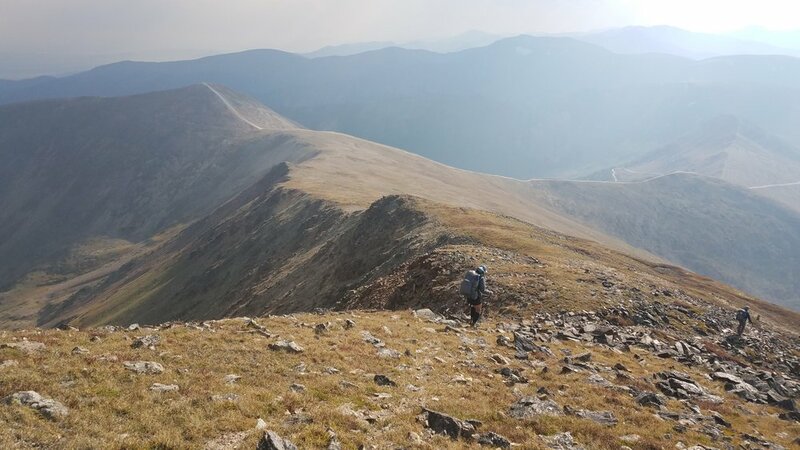 But the two alternates gives thru-hikers the opportunity to climb some elevation, go over a few more passes and see some incredible parts within the range. The challenging thing about this year in particular is that the Wind's had an extremely high snow year, we're talking 350-400% of normal huge. 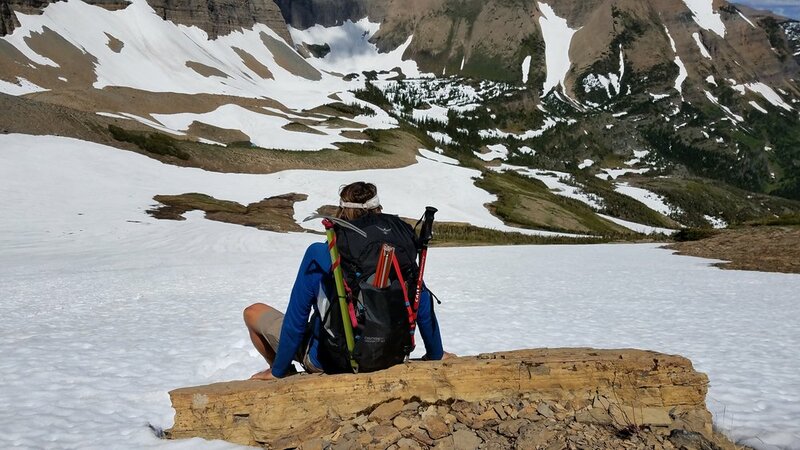 So from early while I wanted to take the alts, I wasn't sure if they'd even be feasible without my ice age and crampons that I shipped home way back in Montana. I'd made it a point to ask all the NoBo's I passed if they'd done the alternates and the snow levels. They other factor I had to keep in mind here is that they are doing everything in the reverse of how I'll be doing it. That nuance may not seem like much but in my experience I much rather go up a snow field than have to come down one and by all accounts of the NoBo's the east face of the mountain was still shrouded in snow- the face I'd be descending. All in all I decided take a hybrid alternate for Knapsack Col, which let me see the grand mountain without having to climb over it and took Shannon Pass instead- a much safer route. But, of course, I still wanted to see the snowy face of the monster so I ended up walking a few miles back northbound on the trail just to have a glance before continuing on southward. The snow pack up here around 11,000 feet is still pretty thick. Throwing snowballs in August, there's a first for everything. Near the top of Shannon Pass. The one thing I won't miss...crossing sketchy ice bridges. 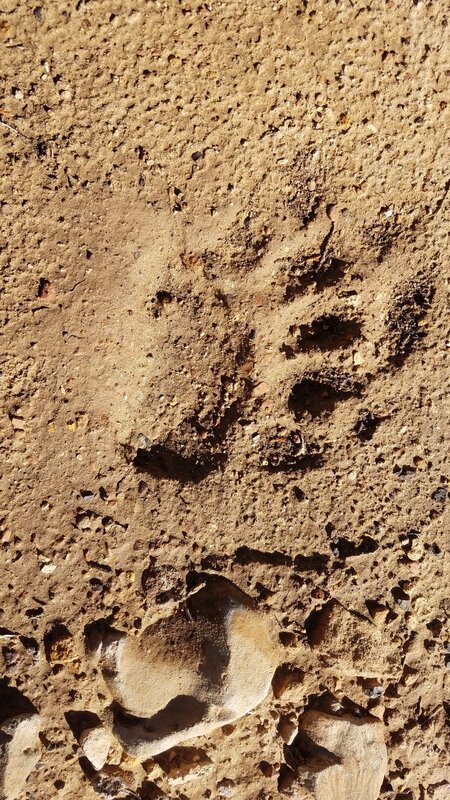 This one seeemed to be levitating as I walked across. The next couple days were definitely not as logistically confusing and I hopped down into Pinedale to meet up with Breakaway who was coming out to hike with me again. I'm so incredibly happy and greatful he's joined me out here for these bits, driving all the way from Jackson to do so. Breakaway and I found an amazing camp spot- one of my favorites of the whole trail and were treated to glowing redish-orange mountains for sunset that evening. A day later and I was heading down The Cirque of the Towers alternate. This alternate consist of three major passes, each one sending you straight up the side of a mountain only to come straight back down on the other side. 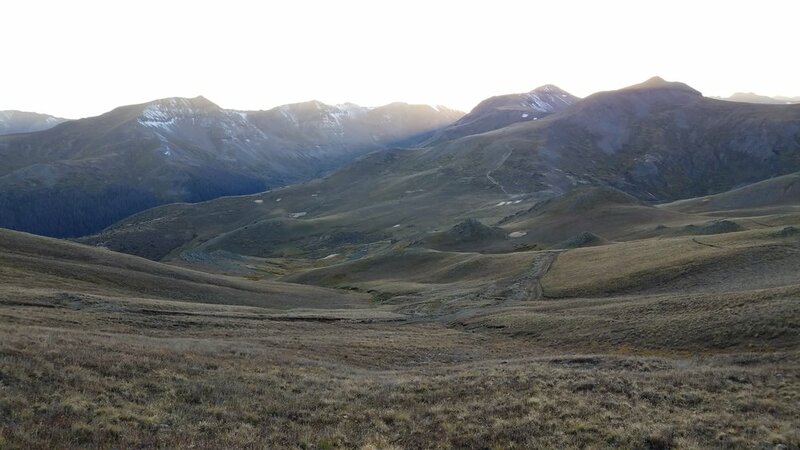 The first pass I encountered was Texas Pass which mostly consisted of me crawling up a scree field on the way up, crossing a snow field at the top and navigating around snow fields on the way down. And to be honest, this set the pattern for the other two passes ahead both of which contained the same challenges in unexpected orders. In all The Cirque of the Towers was stunning. If you ever find yourself in the area I'd recommend going out to the Wind's to check it out. Yes, I am still a walkin'! I was pretty certain I would have cell service in Yellowstone or at least the Wi-Fi, right!?!? 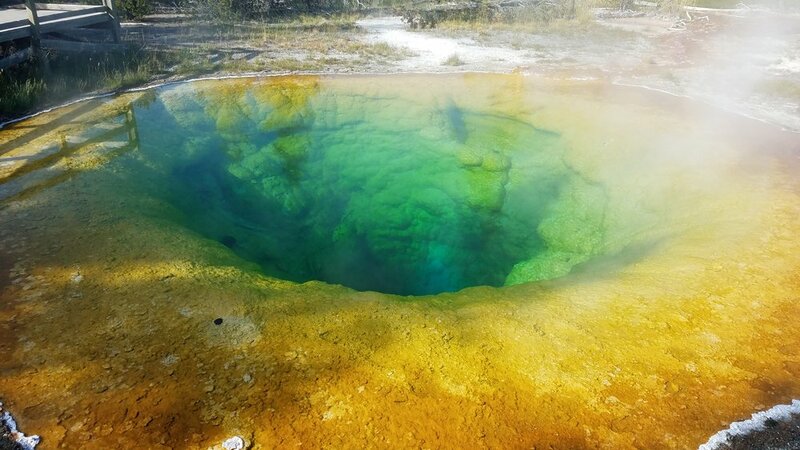 It's a national park, don't they want the word to get out on Instagram how awesome your family vacation is at Yellowstone!?!? Sadly no, or more acuratly At&t doesn't care if you want to post about your rad shot of Old Faithful. Oh, and a storm knocked out the only Wi-Fi in town too so none of that for me either. Anyway, that's my excuse for not posting in awhile. Things here on the good old CDT are going. 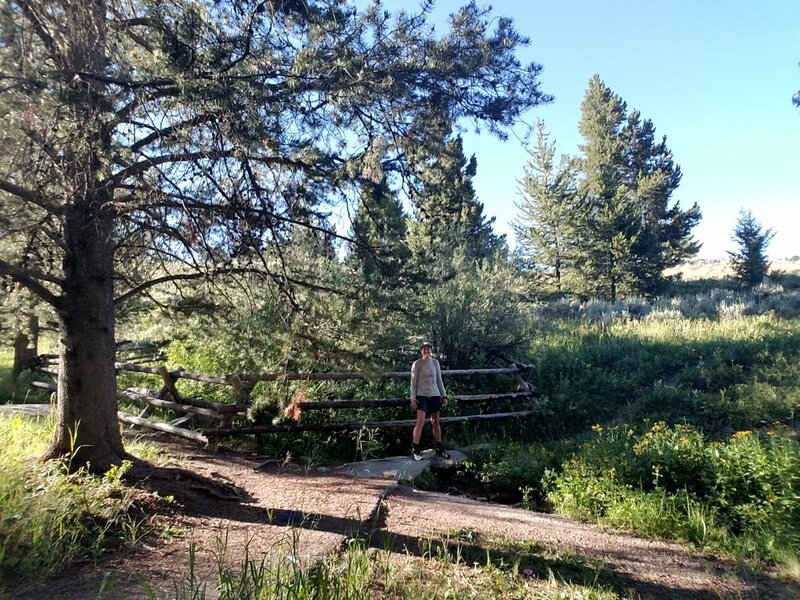 Through good and bad, blazing hot, wet and cold, trail and no trail, the only real continuity is that (for the most part) the sun rises on my left and set on my right, leaving both sides of my gave equally sunburned. 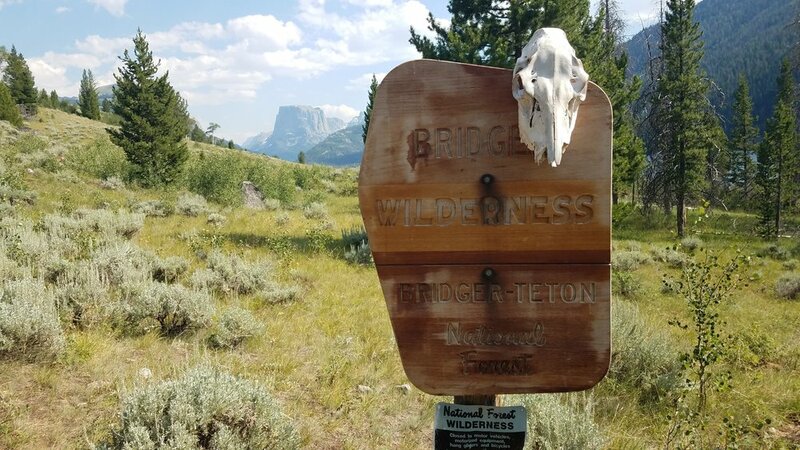 Since the last time I posted, I successfully completed the states of Montana and Idaho, crossed over into Wyoming, hit the 1,000 mile mark and made it through Yellowstone National Park. But other than that, same old, same old. My days having mostly still been solitary, but as of just yesterday I've begun to see more North bounders (horray- 7 in one day!!) 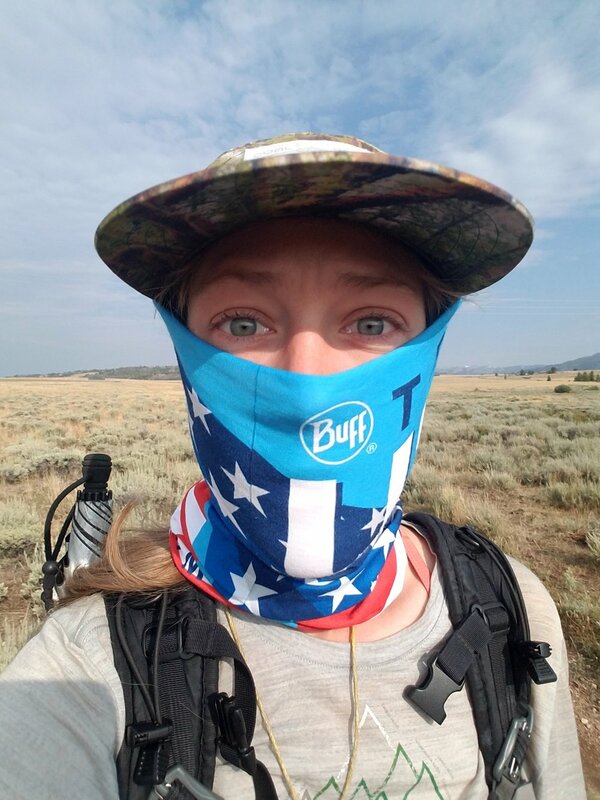 And even st my current town stop in Dubois, WY right now, there are 4 whole other thru-hikers! They are all NoBo's but hikers none the less. I've been told (by almost every NoBo I've met) that I'm the third SoBo they've seen. Two guys, a Brit and a German, and then me. So for me there will be no catching the SoBo pack but perhaps the pack might catchup to me. As for now I'm just happy to be seeing other hikers, even if we are most literally crossing paths. As for the highs and lows of the past 10 or so days. The last of Montana/Idaho (honestly we zig-zagged across the border so many times I never knew what state I was in) it seemed like one long bush-wack. Until the map actually called out "start bush wack here" which I have never see written on a map before. 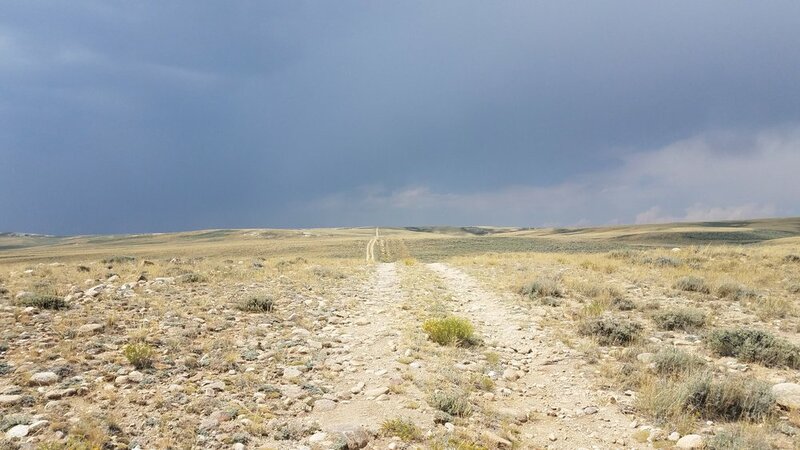 But in a way I find it more liberating to be honest when a trail doesn't exist rather than spending time looking for something that isn't there. Having no trail is an open canvas and I do wish in these sections CDTers all had trackers on them. I think it would make for an interesting art project to frame a landscape from birds eye view, tell hikers they had to get from point A to point B, and track each person's line. No doubt each person's would be different, maybe only slightly or perhaps vastly. And maybe similarities might form between the NoBo's and Sobo's depending on the type of terrain we'd faced before. If the NoBo's were used to following rivers it might be the familiar route we'd take, the SoBo' high up on ridges- maybe the route they'd take. Or maybe differences based on age or weather or pack weight. Or more like just chaos only confined by the boundary of the canvas of the landscape. Or maybe I'm just tired and starting to ramble again. Anyway back to the last 10 days... I like to think of the difficulties in Montana as just a way of it really wanting me to stay. It was determine to keep me there but alas I had to move on. I said my goodbyes and thanked it for the gorgeous views, find memories and amazing people I'd had the pleasure to spend time with. 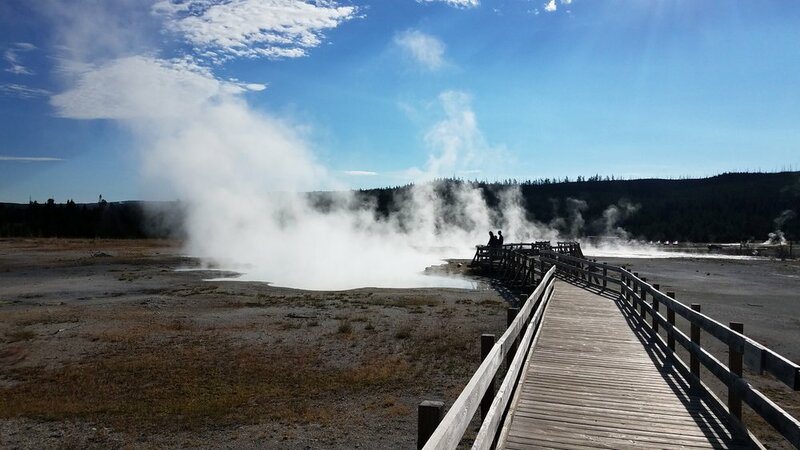 Then Wyoming and nearly immediately into Yellowstone which was rather fantastic with the thermal areas- unlike anything I'd seen before. If you do get the chance to go I recommend doing some of the backcountry trails. You'll find magnificent thermals with a fraction of the crowds. And apart from some misplaced packages and no cell service, the all you can eat breakfast was true to its name. And the high of some magnificent trail magic by way of an old friend surprising me with his presence. My good friend Breakaway, with who/whom (I have no idea, use which ever one you think it right) I hiked part of the PCT with, met up with me on trail for an afternoon of hiking! To the most loyal of my followers- you'll remember Breakway was the mastermind behind the side trip to South Sister, one of my favorite memories from that trail. 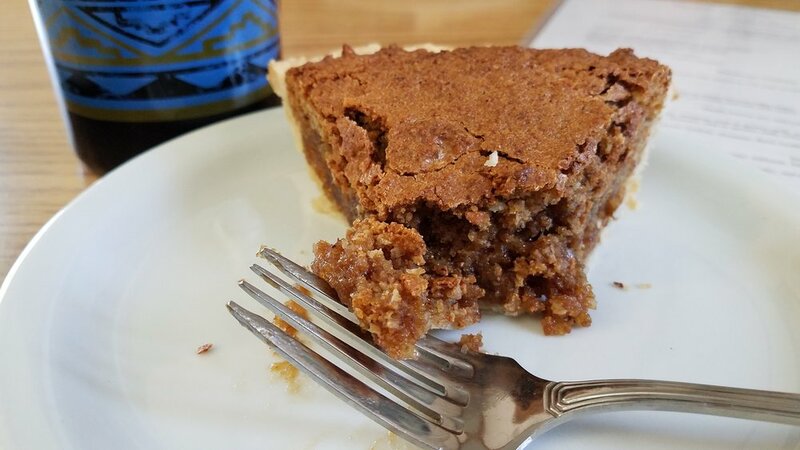 He surprised me at a trailhead with bakery treats, beer and fruit- the thru-hiker trinity. And not only that but it was wonderful to have a hiking partner for the rest of the day and so much fun to catchup over dinner at camp. To Breakway: simply thank you. Holy cow, what a wonderdul surprise and gesture. A memory worth a thousand smiles. 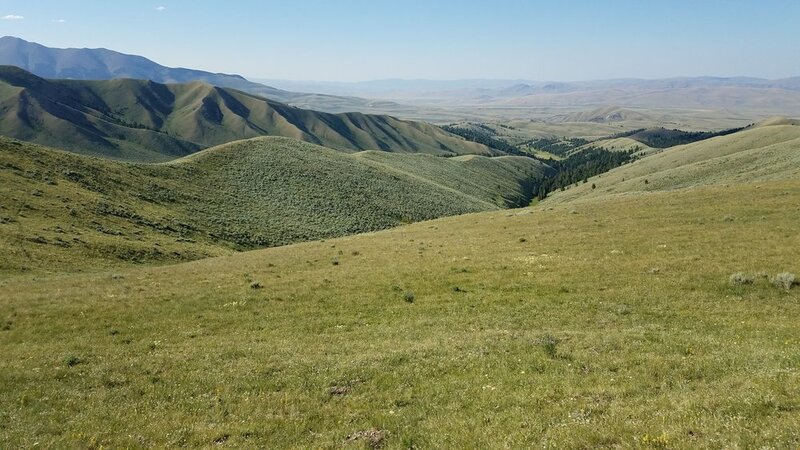 Rolling hills of southern Montana right before Lima. A little worries about what this could mean. Randomly at the top of some hill. Mark's Inn, one of the resupply stops along trail. No idea what the 'playhouse' is, nor do i think i want to know. But just couldn't walk by this and not take a picture it two. Check out my Instagram @outrowalks for the full series. Road walks are even more fun when you have 10' mounds to scramble over. And then later that day, to the WY border! You can tell because im wearing the same clothes. Heart Lake out in the distance, where camp was that night. 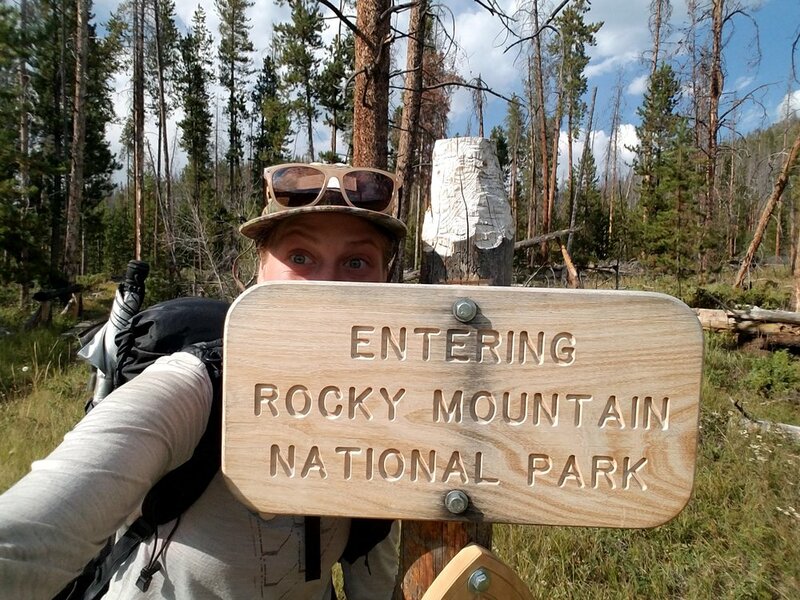 Felling pretty spent that day but always got to get that selfie with the national forest signs. River fording time. The most difficult I've had so far was the North Buffalo Fork (south buffalo fork pictured here). The north was about waist high and flowing pretty good. 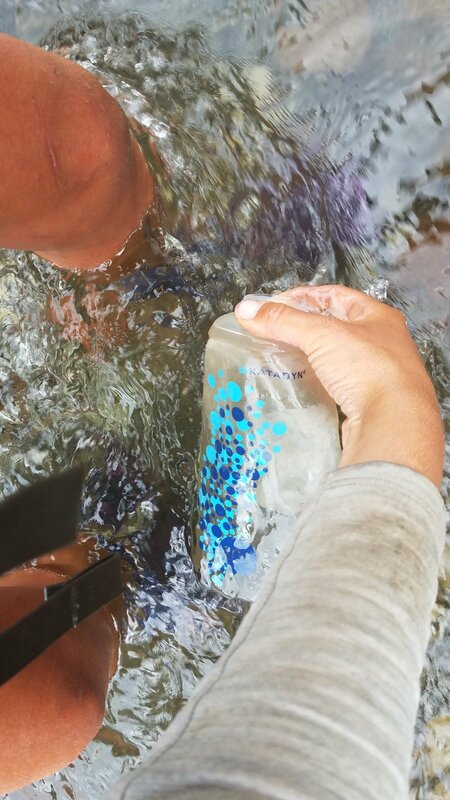 Dont forget to fill up your water along the way. I mean as long as your feet are already soaked might as well get that nice and clean middle of the stream water. Loads of afternoon storms recently. At least this one comes with the prospect of gold. 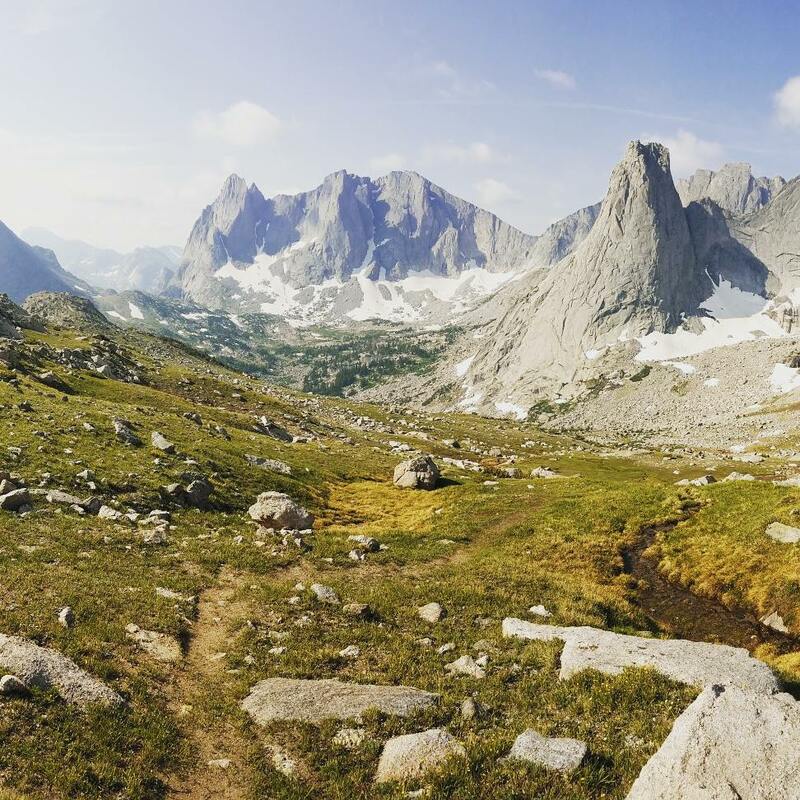 Can already see the landscape start to change as I approach the Wind River range. 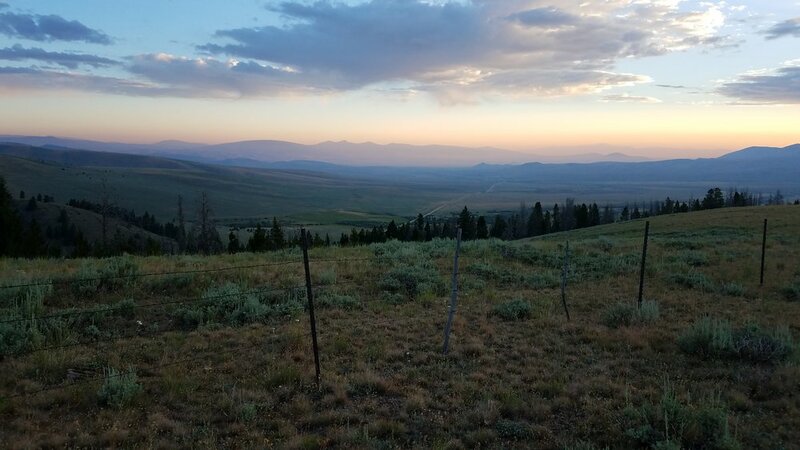 I just made it to Leadore, Idaho, and like all town stops the day has managed to slip by me and it's already somehow way past my bedtime and I'm frantically trying to update the blog. So to help me out I'm just going to use excerpts from my daily journal which I've kept out here. Guthook tells me I'm at mile 765.9 but honestly, I don't think anyone really keeps track of mileages out here like they so on the other to trails. I had the pleasure of talking to my mom earlier today (something this trail, or rather AT&T, doesn't allow me to do enough out here) and I now see the Tiple Crown Hikes in this manner. 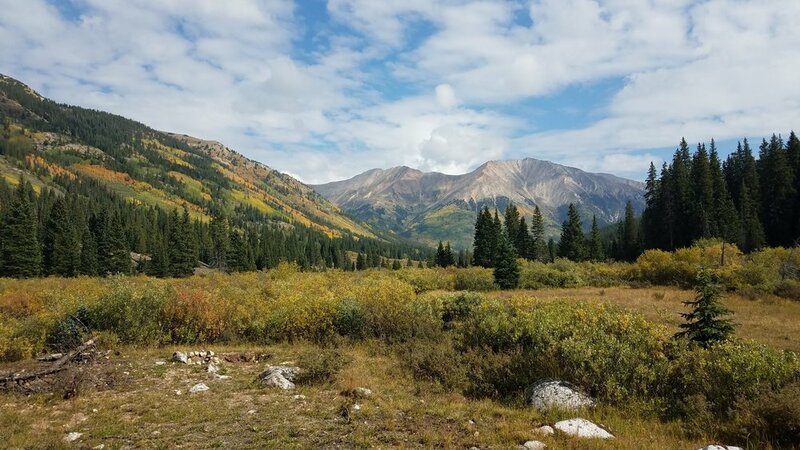 "I swear to make the AT, a group of skilled trail builders went out into the backcountry and physically made the trail. 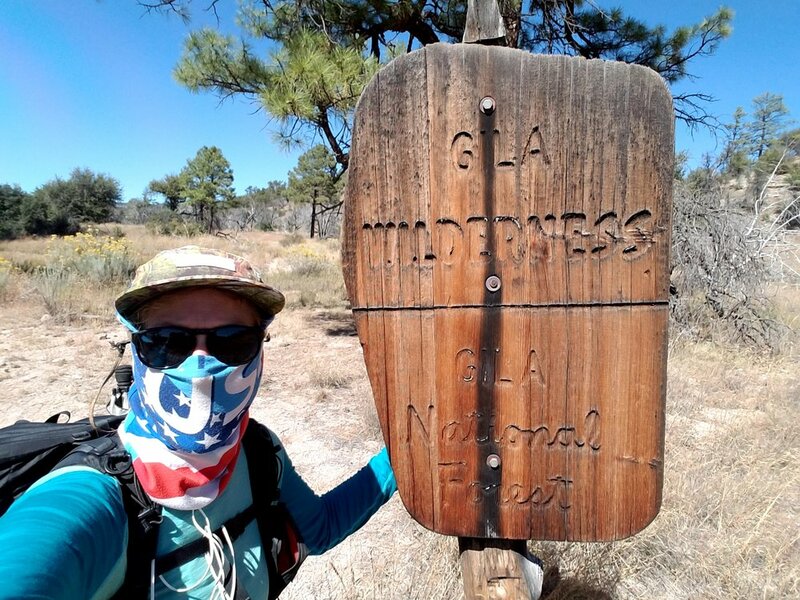 To make the PCT, a group of highly trained professionals coordinated the best connections of routes and poured over logistical concerns. 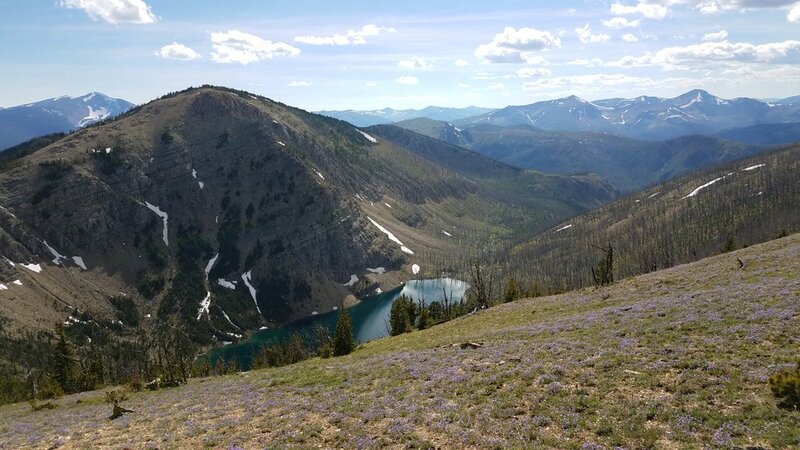 To make the CDT, someone gave a toddler a map and a crayon and the aftermath is what I'm hiking." July 17. 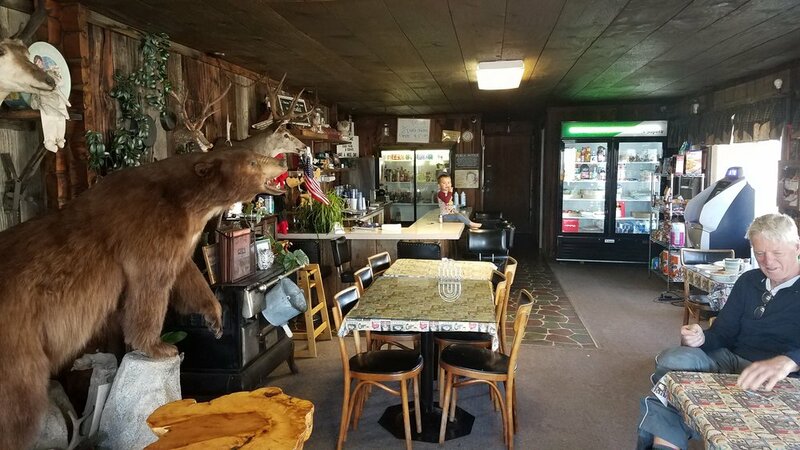 This is the restaurant in Leadore. Not A restaurant, The restaurant. Here is the first, in hopefully a long line of reviews I'll do on all (or most) of the products I carry in my ULA Circuit pack. See, I'm already dropping product names on ya. I figure I'll try to pair a product with a food item for no other reason but diversity. So sit back, relax and get ready to read a whole bunch of my rambling opinions. Someone, cue the dehydrator's hum. I've been a Salomon fan ever since hiking the Appalachian Trail in 2015. A friend recommended that I try Salomon's because of the wide toe-box and as they say, the rest is history. 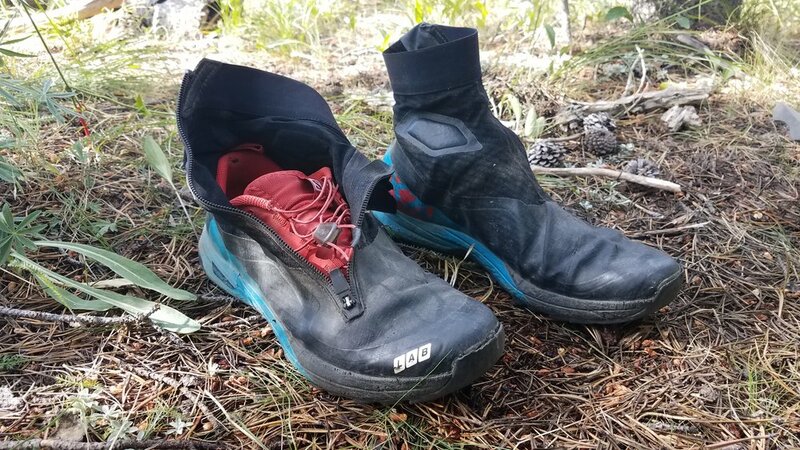 I've worn through 9 pairs of Salomon's total, 4 on the AT and 5 on the PCT, as well as tried 5 different styles- all in the light hiker, trail runner series. 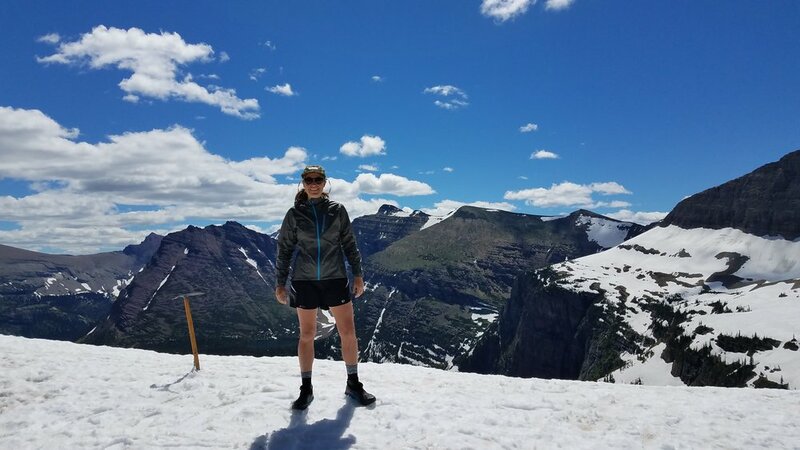 The reason for the variety was that sometimes I was at the mercy of the on trail outfitter if I needed a pair asap, and sometimes one style seemed to fit a particular terrain better. Just some rules of thumb I like to keep- the reason I like trail runners better than boots (for thru-hiking, hear that, I said for for thru-hiking, not just for general hiking. Please consult a doctor before any serious activity. Please accept iTunes terms and agreements. Ok I now hold no liability.) is due to weight and blister prevention. When hiking 20-30 miles a day, weight matters. Someone once told me that a pound off the foot is comparable to seven off your back. I have no idea if that's true but I think the point holds true. Hiking many miles a day, I want the lightest shoe possible. Next blister prevention. My feet swell a lot when I'm on trail. I'm talking over two thru-hikes my feet have grown 1.5 sizes. Plus day to day swelling that occurs. So I want a shoe with tons of wiggle room in the toe box, which I think trail runners do well, usually with a meshy stretchy upper and sides. That way, no blisters between the toes. Also i want a shoe that's going to dry quickly after I ford a river. With sometimes 15 fords in a day there's no time to stop and change shoes. If the shoe doesn't dry, your foot doesn't dry and wet feet blister easier than dry feet. 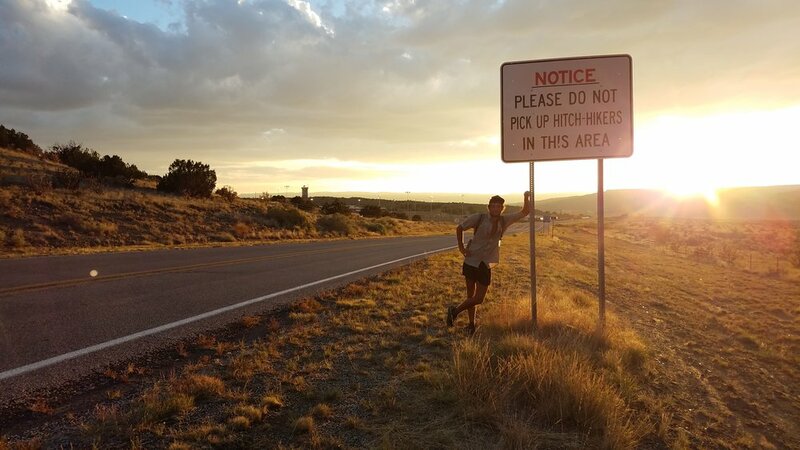 Also, trail runners have a quick break in time. Most of the shoes I wear on trail, the first miles I ever walk in them are on trail so break in time is zero. All of that is why I love trail runners and for some reason only known by the trail gods and last makers, Salomon shoes fit me like a glove. Now to the XA- Alpine. This was the first time I wore this particular style and I'll tell you what...i fricken love them! One of the most notable features is the built in gaiters perfect for keeping out dirt, rocks and debris. They still have the awesome quick lace system underneath too so that's a plus. I was concerned that the zipper would be a point of failure but after 650 miles +, it was still going strong. 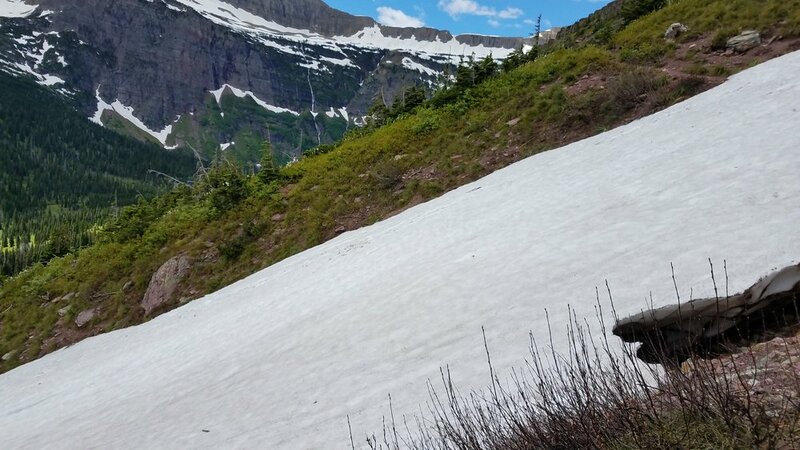 I tested these through some of the harshest trail conditions the CDT has offered too. I loved them in the snow because 1) they were compatable with the Black Diamond Contact crampons which I need up in Glacier and 2) they were water proof on the lower section which kept my feet dry in the low snow. On rock and scree they also performed very well with great traction. As with the rover fords, I know I can't have the best of both world's but I was close. The water proof lowers just meant that when did creek crossings I would just unzip the shoe right after, let out some of the excess water and the show would actually dry amazingly fast. In my experience not as fast as the Speed Cross Pro but not that much longer. Really the only minor criticism I have is of the color. Although the black, I think, looks super sharp, it could get a little toasty in the Montana burn sections with little shade. Overall, I would definitely wear these again! The tread after 650+ miles. My general rule is that if I can get 500 miles out of a shoe, they have done their duty. These were going along so well I actually forgot to have another pair shipped out to me at the 500 mile mark. I'll start with something light and simple... coffee! Now I know what you're going to say, oh my gosh not Starbucks via?!? Because honestly out here you will see hikers eating Ramen and Pop tarts but then drinking Starbucks. Weird phenomenon. Anyhow, this is what my grandma drinks and I guess it runs on our family because I like Tasters Choice too and reminds me of my grandma so it has bonus nostalgia points! It all started as I began my descent to Rogers Pass, precisely located at trail mile 294.9. The prospect of laundry, a bed, a shower, oooohhhh I was giddy with anticipation. That was, until I ran into a local hiker who way too eager to tell me about the Lincoln rodeo going on in town this weeekend. "Oh it's a huge town event, every accommodation is completely booked," she exclaimed. All I kept thinking was, how is a town of, I don't know, 10,000 people could be completely booked. In hindsight, that was my first mistake. Lincoln's population is only a fraction of what I had envisioned - can't remember what it is exactly but I'm sure Wikipedia does. Any hoo, I was a little discouraged as I got to the pass and stuck out my thumb but still optimistic that maybe, just maybe, somewhere a rodeo clown with a reserved penthouse suite was sick with the flu and unable to attend. Only one car passed before I saw break lights come on as the second car slowed to a stop. Fate was on my side that day although I didn't know it just yet. I got in the car and a quick conversation with the driver revealed that Lincoln was in fact full of rodeo enthusiasts. The problem was I needed to stay in town until the post office reopened Monday morning...today was Saturday. That's when J (names changed to preserve privacy 😊) proposed this - why don't I just stay with her and her husband, M, at there cabin just outside Lincoln. The only downside was, there wasn't one! Floored by the generosity, I accepted. What preceded was one of the most unexpected, incredible weekends of my life. 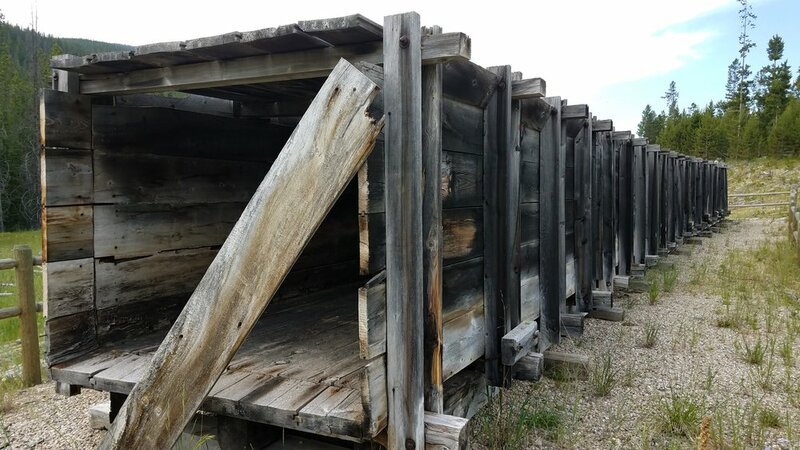 It turned out that a bunch of their friends also had cabins on adjacent properties. I ate incredible homemade food, had a cabin to myself and not only conversed with other living, breathing humans but heard tales of Namibian safaries and baguettes in Paris. 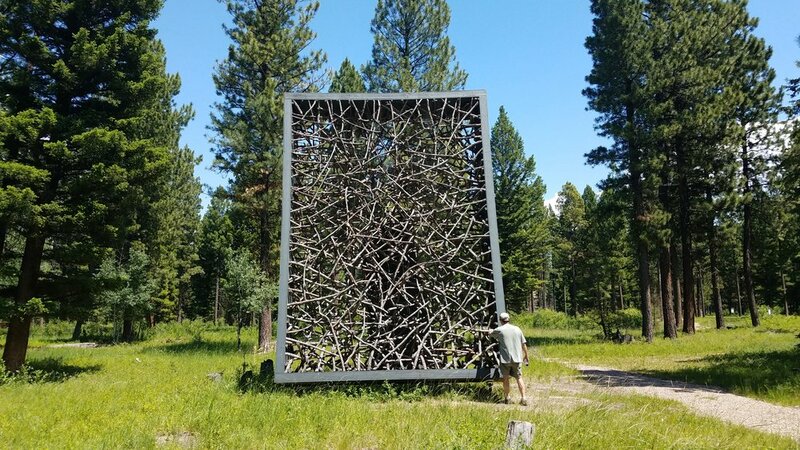 The next day J and M took me to Blackfoot Pathways: Sculpture in the Wild, self described as an 'International Sculpture Park celebrating the rich cultural, environmental and industrial heritage of the Blackfoot Valley. Couldn't describe it any better myself, other than to say, What A Treat! 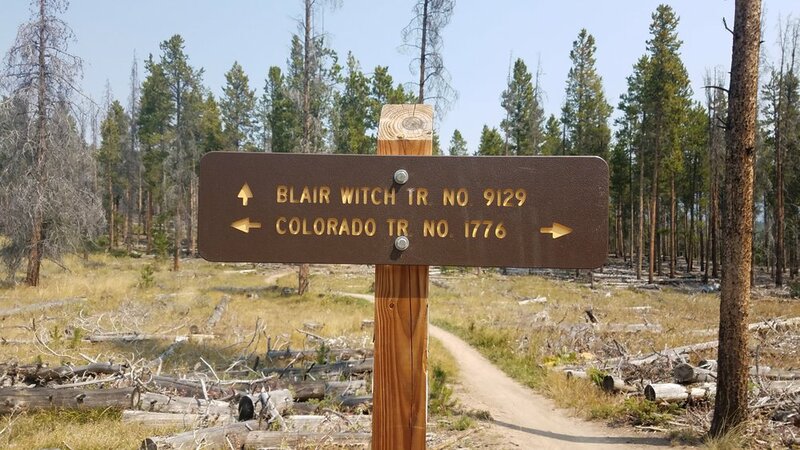 One of the many reasons I hike these long trails is because they take me to places that may have gotton lost in the world of Google reviews and Trip Advisor ratings. And that's not a negative dig on those applications or on places that don't have a five star rating. It's only a gentle reminder to myself to trust the road (or trail) ahead, it can take you to some most unexpected locations. That night, rivaled only by the evening before, was another home cooked meal made by the cabin neighbors and long time friends, M and B. If the past couple days wasn't enough, J even drove me to the post office the following morning, waited while I re-supplied and dropped me back off at the trailhead. In my opinion, the most incredible part was that J didn't know I was a thru-hiker when she picked me up. The whole weekend was a total and complete random act of kindness, trail angels in every sense or the term. 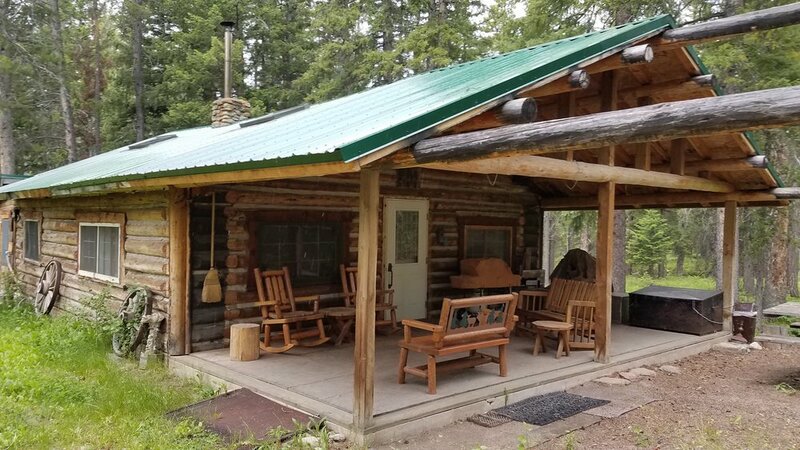 I learned two things that weekend: Someday I want a cabin in the woods in Montana and keep hope - beautiful experiences can come from seemingly dire situations. A sculpture of newspapers, weathered over time. Back on trail, rejuvenated after my time spent with all the fine folks I met at the cabin oasis. Homemade muffins to-go, made by one of their friends. Really felt like I was roughin' it that day! I thought it might just have been super windy the day I was ridge walking but the trees told a different story. That looks like wind + time to me. Just so you know, I don't get the self timer right on the first try all the time. One of the many fire towers I've past while hiking but this one was unique because it had residents! Well temporary, but still. The couple staying there that night said the Forest Services rents some of the now unused towers out to folks. But put your request in now. The couple there on the 4th of July booked it back in January. An interior shot of the tower. If I ever come back to MT, I definitely want to stay in one of these. They even kept the old fire detection, survey thingamabobbers whatchmacallets inside. Downtown Helena. I was informed by a local that every Wednesday in the summer they have a city wide block party sort of thing. There was live music and lots of food trucks that evening. From what I saw looked like a really nice town. I could have spent much longer checking out the city but alas, the trail isn't going to walk itself. The next day a local trail angel drove me up to the trailhead. I've heard Lincoln can be a tough hitch sometimes so I was super grateful to have a guaranteed ride. He and his wife also keep up two much needed water caches in one of the dry stretches before Helena! A humanoid of sorts. I'm latching onto anything that even looks vaguely familiar at this point. 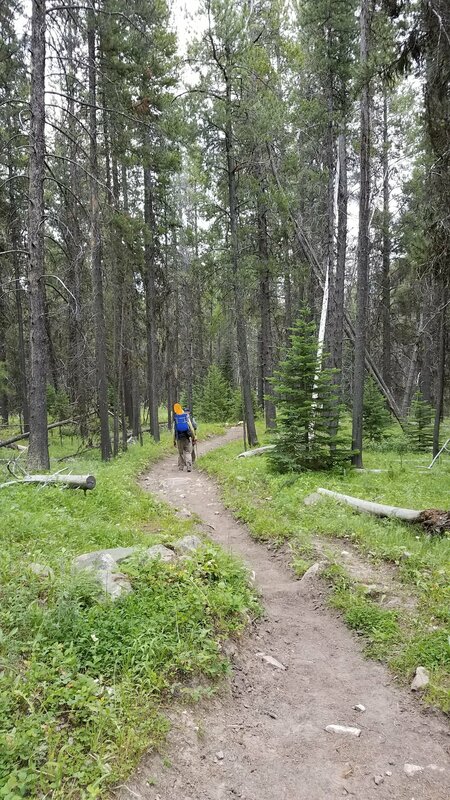 Northern Montana was especially tough with the large volume of deadfall littered about the trail. But boy do those conditions make me appreciate cleared trail and the amazing women and men who spend their time clearing it! This the the totally awesome, incredibly phenomenal, super badass all woman crew who had been clearing trail between Helena and Butte/Anaconda. Chainsaws in hand, they go from down tree to down tree doing backbreakimg work so us hikers can walk on through without breaking stride. After the shenanigans of the north, I've made it a personal mantra that any time I pass a tree which has clearly seen human intervention, I bow my head and whisper "thank you kind stranger." All your hard work is not for naught. I, nay, We, appreciate your hardwork immensely. So to those four women and all the trail maintainers out there, I bow my head and say loudly this time, "Thank you kind strangers." Painted on the side of a building right near the Anaconda Post Office. In town this weekend is a huge softball tournament dubbed the Woodstock of softball. This has been a very difficult trail to say the least. I write this from a laundromat in Anaconda, MT, sitting here in my rain gear (because every other article of clothing I own is in the dryer). All evidence leads me to believe I'm the only CDTer in town. A stunning contrast to the past two hikes where I couldn't walk a block without some bearded man or tangle-haired women yelling "Hey, hiker trash" (a term of endearment in the thru-hiker community) To this, now, not seeing a fellow compadre for days. It has taken it's toll. As a self proclaimed introvert, the CDT is doing her best to falsify that claim. 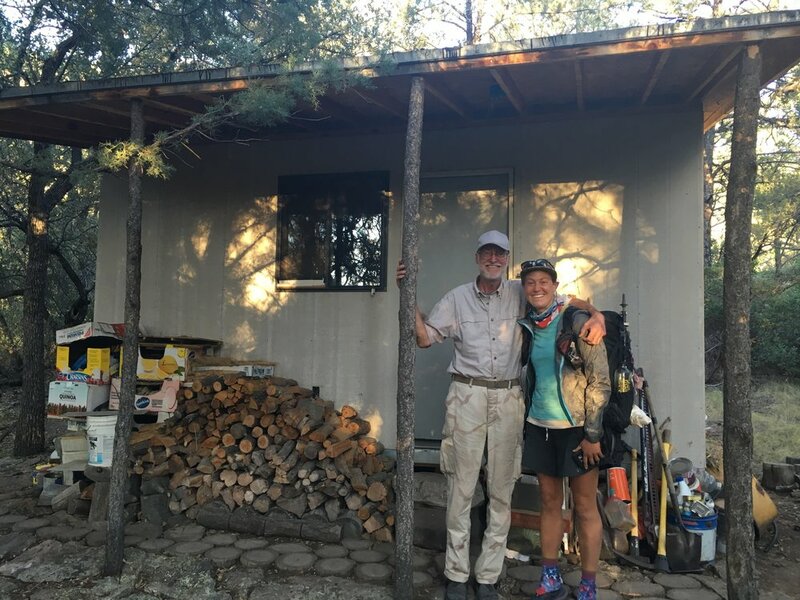 This week especially though, meeting a train of simply extrodinary people I was reminded of something simple; to be grateful everyday for the opportunity to pay forward the kindness and generosity that was bestowed upon me in the outskirts of Lincoln, in Helena, deep in the Montana forest. And to all people who have helped me on any of my journeys; taken me in, given me rides, sent me packages, emailed me messages of encouragement, sent me virtual thoughts and prayers- You inspire me to smile, to love, to laugh, to walk, to be a better human, ultimately to pay all of it forward. It may take a lifetime to do but I've got a lifetime to try. In architecture school some of my favorite drawings I did were simply Not To Scale. The professors hated it because you can't build off a document that doesn't have an associated scale. However, I loved it because it meant I could blend and mold landscapes with buildings, human proportion with natural order, in whatever way i thought worked for the composition. It was university anyway, it's not like I would be submitting these to the city for aprovaI. I think drawings, composted in this way, took on a life of their own. Instead of everything fitting perfectly in it's place, different objects with different storylines clashed and merged, maybe for only this one time on the sheet of paper upon my desk. It brought dissonence in the details, it brought harmony to the whole. Or maybe vise versa on the next sheet. It's seems I may have taken a page out of Montana's playbook without knowing it. 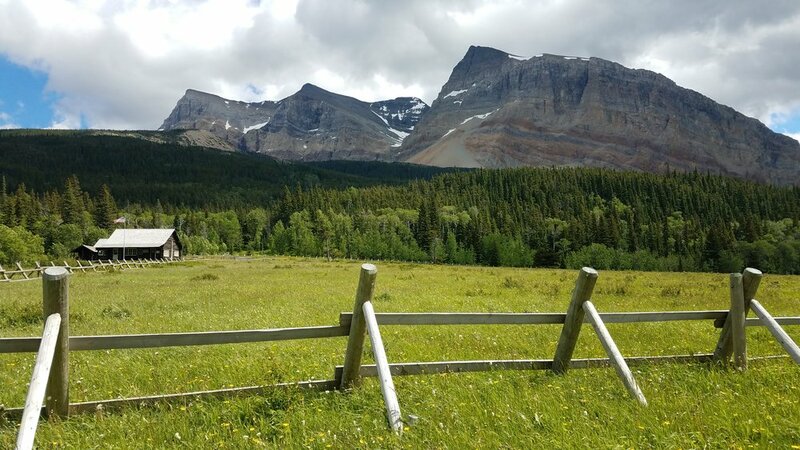 This is what Glacier, the Bob Marshall and Scapegoat wildness have been for me. Powerful, fragile, terrifying and uplifting. A wilderness that keeps me teetering on comprehension because it's not to scale. An old horseshoe hangs from a tree where I camped one night. All that snow this year means there's been amazing wildflowers out on trail. Yay, some signage! The small luxuries in life. So you're telling me there's no camping near the bridge...then that means...there's a bridge ahead!! One less ford to do today. Humans!!! Spotted in their natural habitat. Mission successful, I talked to them and they talked back. No more figments of my imagination or trees that look an awful lot like people. Our 5 min. conversation was, within the context, spectacular. Outside of the woods, probably a 4 out if 10, mostly because I'd forgotten how to string sentences together. Benchmark Wilderness Ranch. They hold hiker packages in that gearbox on the porch. A very nice couple who happened to be out for a drive gave me a lift to and from the trailhead and ranch. The only shade for miles around. Almost frlt like i was in SoCal again. 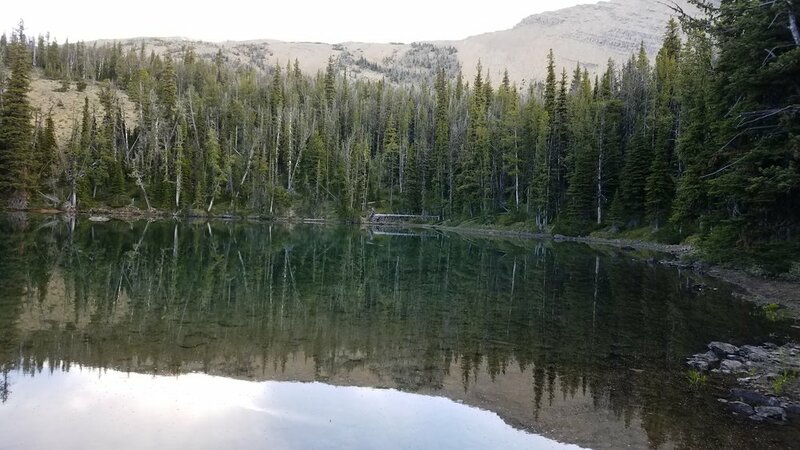 A hidden lake high up in thr mountains. It's always nice to camp beside a lake. Sure the mosquitos were horrendous and I'm fairly certain they almost lifted up my tent in the middle of the night, but st least there's no snow! I don't think I'll ever understand how there's guys made their journey without ultra-lite gear and GPS. Glad to be doing this trail now-a-days. Yep, a yurt in the middle of nowhere. What an wild first week! 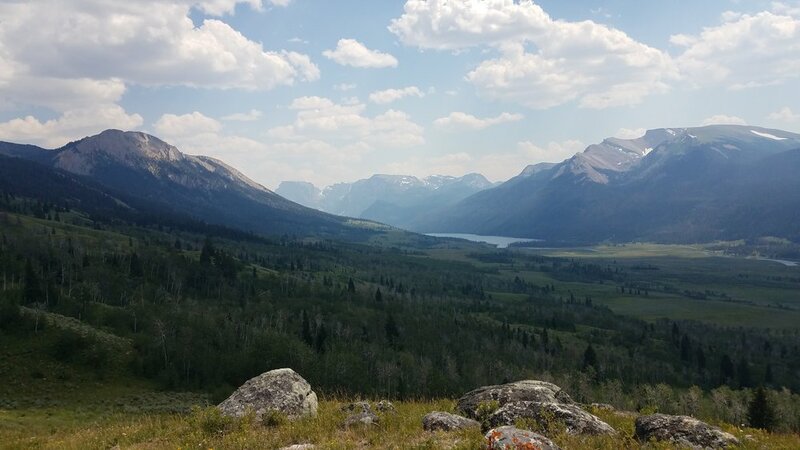 After an amazing road trip up to Waterton with my parents, there was nothing left to do but start hiking. I'd be lying if I said I was extremely nervous about this one. 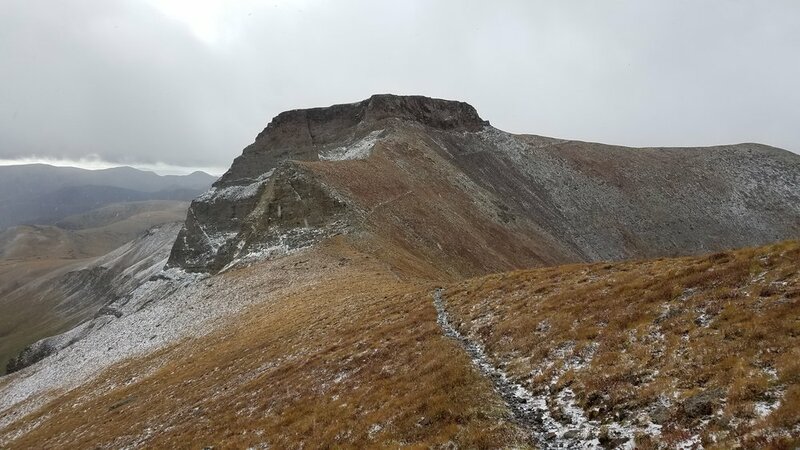 The CDT has always held this kind of mysterious power over me, equal parts intrigue and shear terror (well maybe like 2 parts to 1, but I'll let you decide which part is which. All summer I payed close attention to the snow reports so I knew coming in I'd be dealing with snow travel out of my comfort zone. 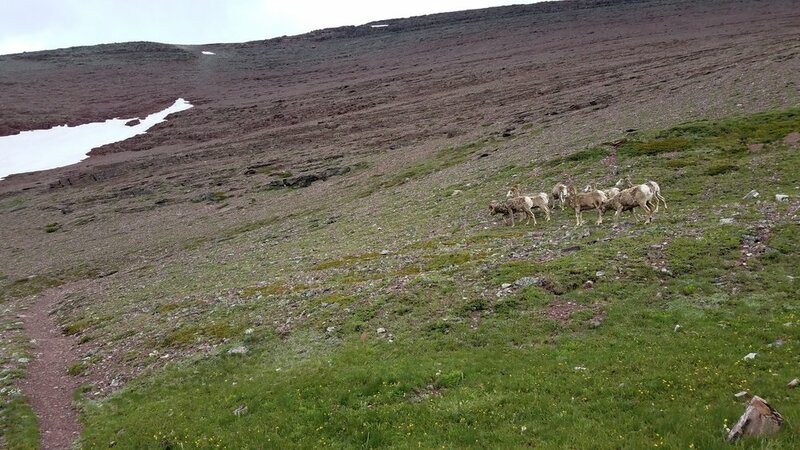 It wasn't until I went to the ranger station at Many Glacier when everything became very real. 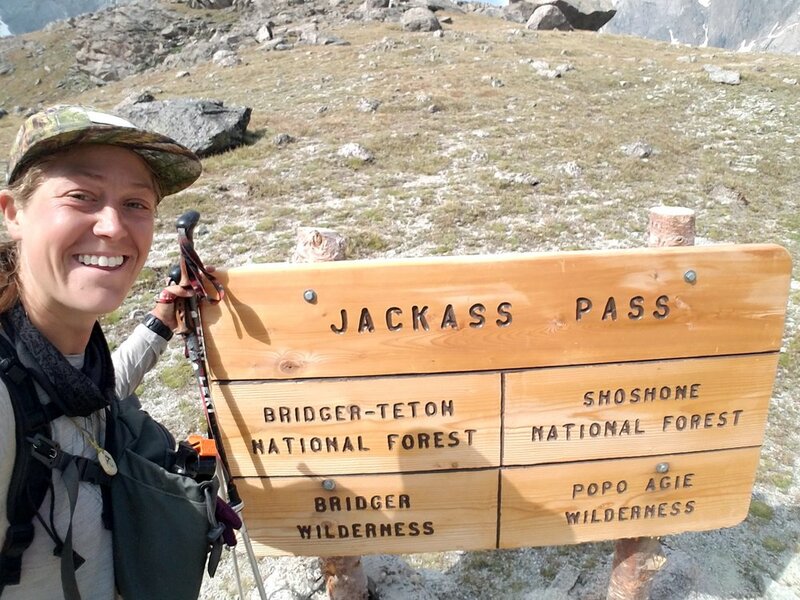 Only one hiker, to their knowledge, had made it through the four major passes to East Glacier. Here I'm used to starting trails with tons of hikers in front, with and behind me, but for the first time in at the front of the pack - very unnerving. But with crampons, ice age and compass in hand and waving goodbye to my parents at the Chief Mountian trail head, I headed south. At the Canadian, USA border. Chief Mountain Traihead and also the staring location for the Pacific Northwest Trail. Where rangers Tracy and Bruce live... yes, please! met some super nice backpackers at Elizabeth Lake camp that first night. Hope you all enjoyed camping there as much as I did. I feel as though I'm heading into the belly of the beast. Going up Ted Gap pass. The rangers said this was the easiest of all the passes, as far as snow travel. 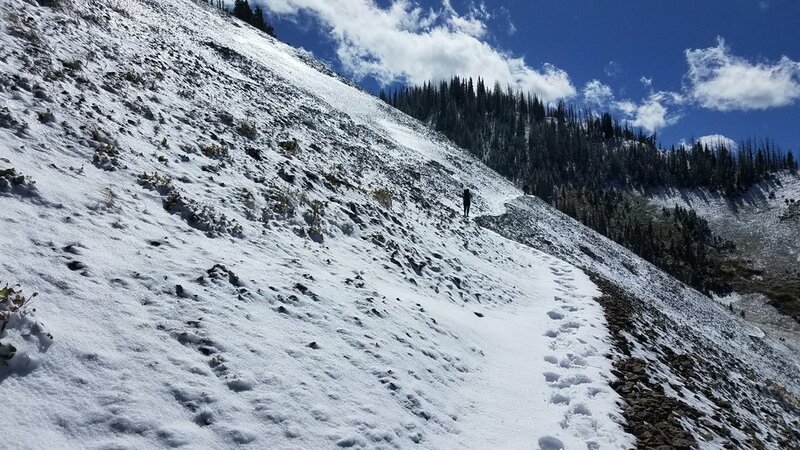 Spoilers: they were right, but it still had more snow than nearly anything I'd seen on the PCT. FRIENDS!!! Starved for conversation, I definitely stopped and talked to these pals for a bit. And way more snow traversing than I'm used to. Fortunately I have for for these situations. 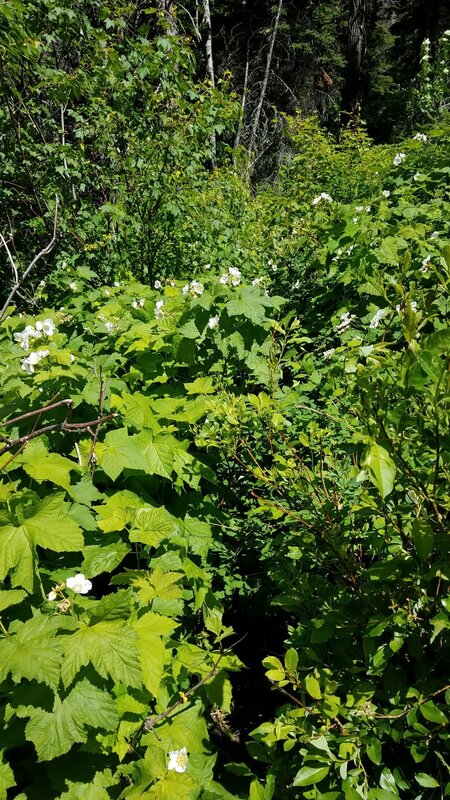 In areas like this I use my GPS to locate about where the trail was, pick out a feature about 40 feet ahead in the direction I was supposed to be going, hike to that spot and then repeat the process for sometimes miles (and hours) at a time. More friends (I hope) out here too! The top of Pegan Pass. I don't think I've ever felt more accomplished than getting to the top of this one. Took everything I had and then some. The route up stated with some major blow-down areas. Then on to orienteering through a conifer forest completely blanketed in snow. Next onto an ice bridge and finally across multiple steep snowy ice chutes. Luckily I had no idea what what at the bottom of them because I never looked down. 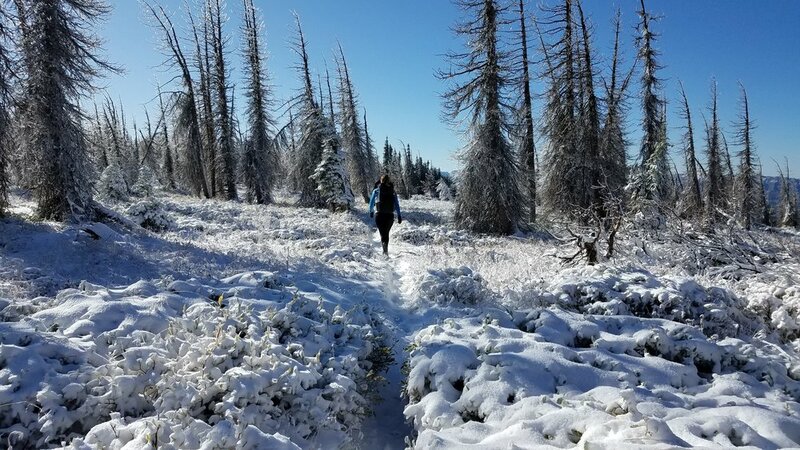 Sometimes the trail is covered in snow and sometimes it's indistinguishable due to overgrown vegetation. Always keeping me on my toes. Luckily, my new pal Captain Stubing and I will be taking this one on together. About 3/4 of the way up Triple Divide Pass. 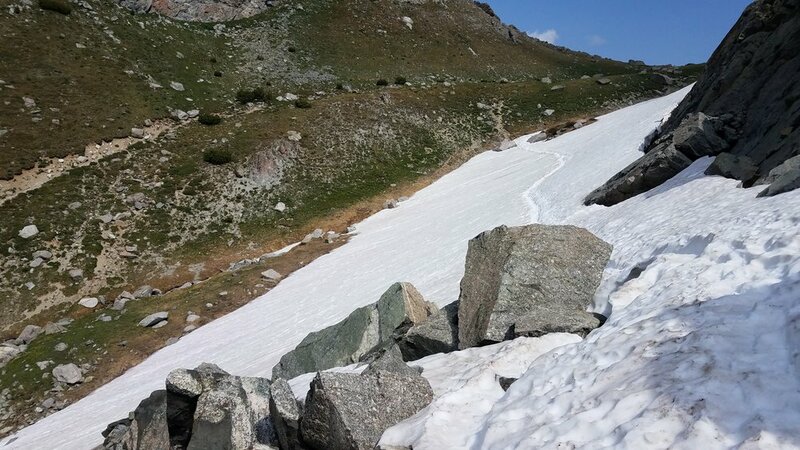 and yes we did just hike straight up that snowy ice chute. If you can't beat em, join em. Finally at the top of Triple Divide Pass. It might not look like much, but slopes like this cause problems for me. I'mstill not super comfortable traversing these especially when a scree field below is waiting patientally for it's victims. After getting down from Triple Divide we reached Cap. Stubings campsite. Mine was still a few miles so once again headed down the trail but after realizing it was still early when getting there I decided to press on and get up and over the next pass. I figured I'd have to hike up it one way or another so now was as good a time as any. Not going to say much about this one other than it once again tested everything and more than I thought I had. A view from about halfway up and seeing clear trail after miles of it under snow. Don't think I'll ever take the sight of dirt trail for granted again. 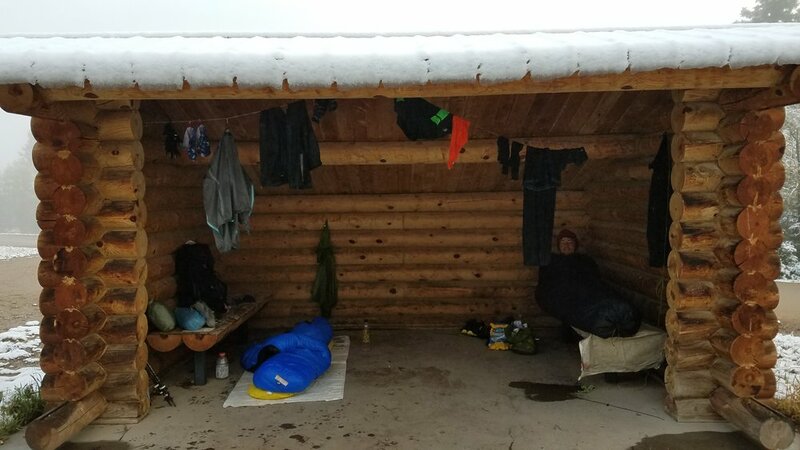 The next morning I hiked the 6 or so miles into Two Medicine Ranger station and turned in my National Park issued Ursak (given because some of the campsites were still under winter conditons). I was also glad to enjoy a hot meal with two hiking legends, Freebird and Raven, both incredibly spirited individuals. 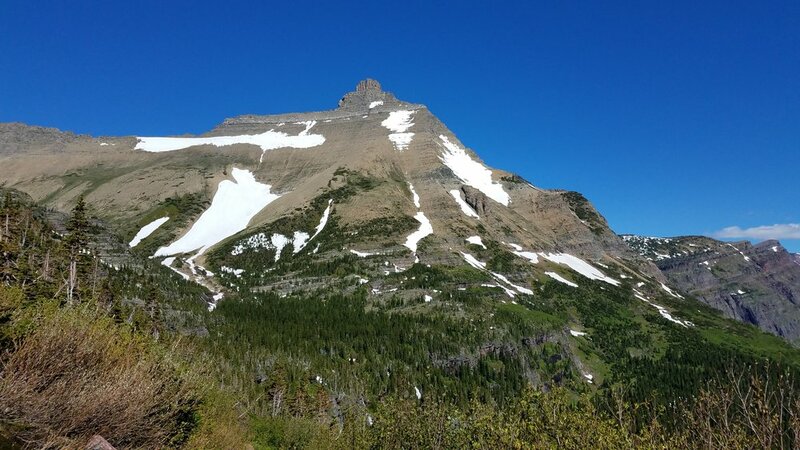 Staying in East Glacier for the night and then back onto the trail. And a huge THANK YOU to the couple at Two Medicine Grill in town. 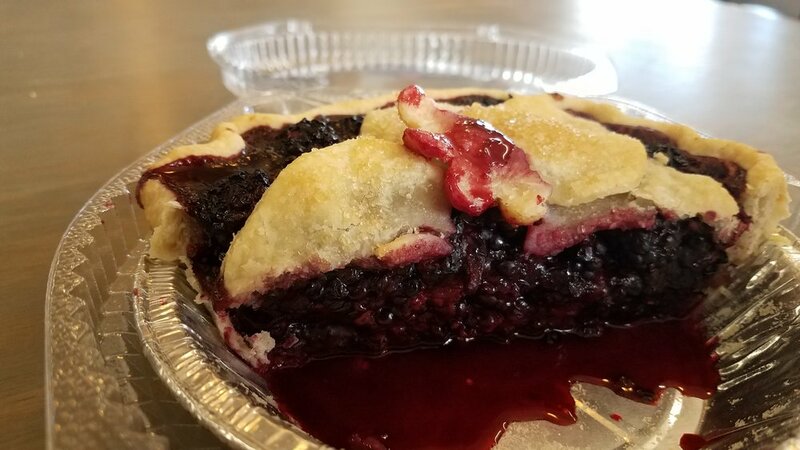 I stopped by the restaurant after picking up my resupply package and happened to strike up a conversation with 1a couple of folks who were in town running a half-marathon the next day. After an hour or so of great conversation and sharing stories we said our good lucks and happy trails. Then asking for my bill the waitress let me know the couple had taken care of my tab. Such a kindhearted act, it will not go forgotten. I hope the race went well for both of you and thank you again for lifting my spirits! 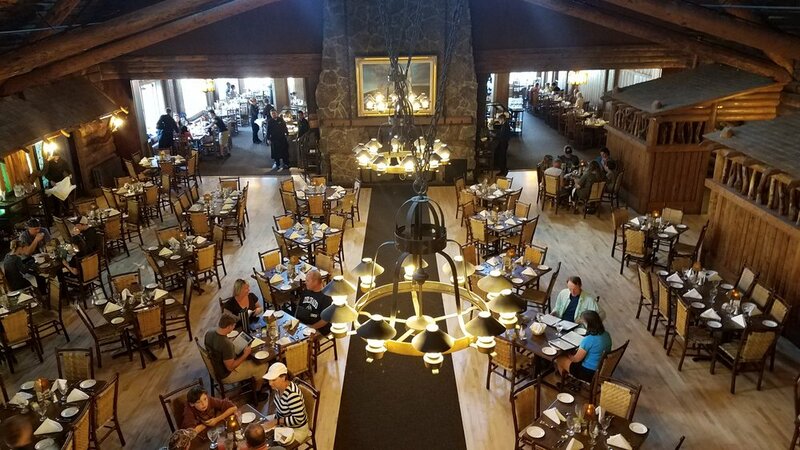 I'm sitting in the restaurant at Cedar Lodge right now after just entering Badlands National Park about 30 min. ago. I'm going to make this brief though because an omelet the size of my face was just put in front of me. 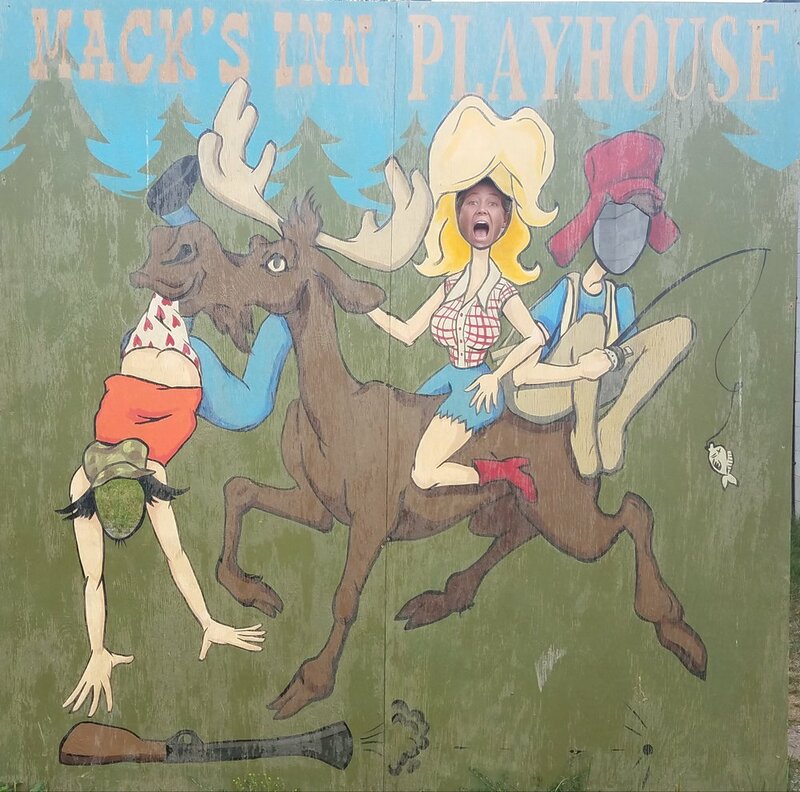 The plan is to hit the trail on Sunday, June 18th but before then, there is much fun to be had on an epic road-trip adventure. I'll keep you posted!